I am saddened to report that Jasmine (you knew her as Slider) had to be put down this morning. She had been battling cancer for some time. The complications became too great. She had a very tough start in life. Jazz joined our family in September of 2009. She was with us only 8 years, but lived a full life in that time. She had a loving home, many adventures, and a cat that claimed her for his own. She is greatly missed. 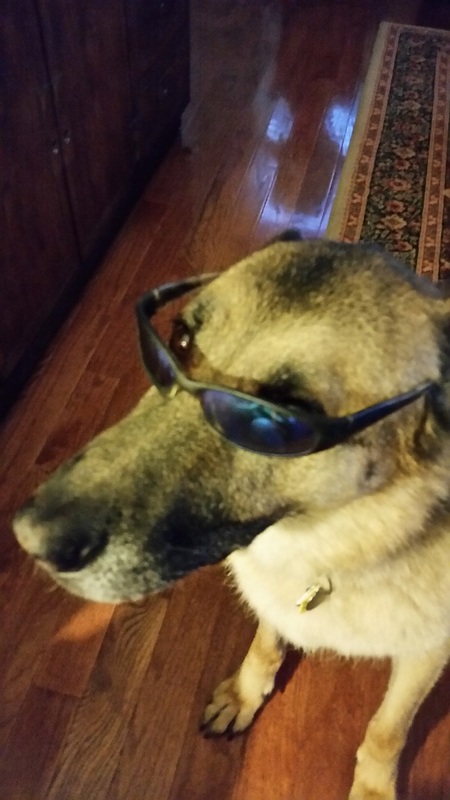 We wanted to let you all know that yesterday, we made the tough decision to let Kaz go. We adopted him in May of 2017 and we were lucky enough to be a part of his life for 7 wonderful months. 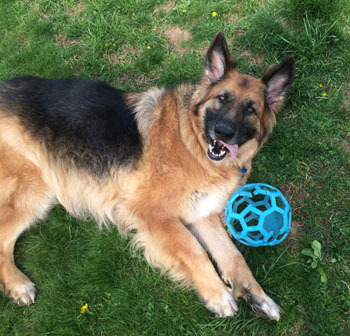 He was the kindest, sweetest dog who was simply happy just being with us. 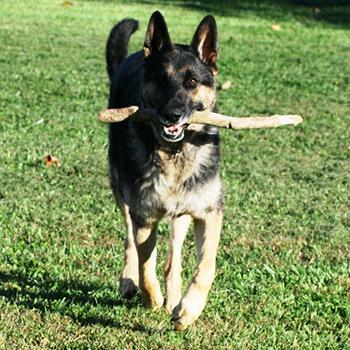 Even in his last days, he still had such a wonderful spirit, and despite his limitations, did everything he could to keep up with his brother (our 3 year old shepherd). It was the hardest decision we had to make, but we are incredibly lucky that he chose us to spoil him in his final years. Thanks again to MAGSR for bringing Kaz into our lives. We are regretfully letting you know that our Diago crossed the bridge last night. We adopted him 10 years ago last week from MAGSR. He was known as Shamus. 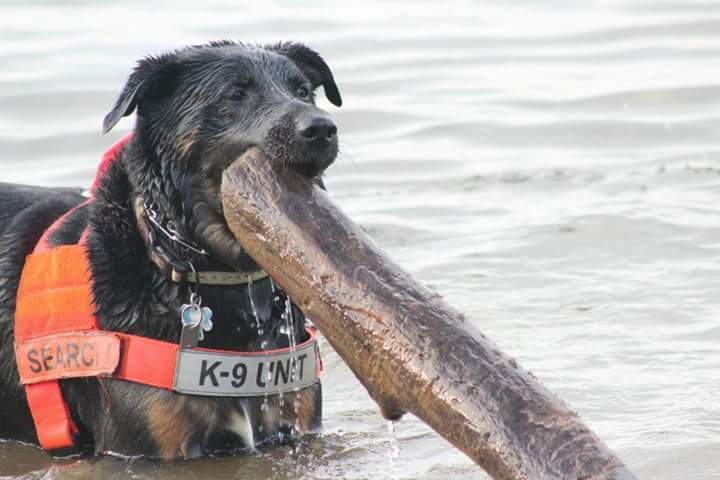 He dedicated his life as a search and rescue k9 saving lost and missing persons. He was diagnosed with Cancer just before Thanksgiving and was given 2 to 6 weeks to live. Our hearts are so broken as he gave us so much love that we so desperately needed. He rescued us. R.I.P. Diago and Thank you for you service. Penny passed away on October 23, 2017. This is very difficult to write, so please bear with me. Penny got at least 2 long walks each day, rain, snow, or shine. 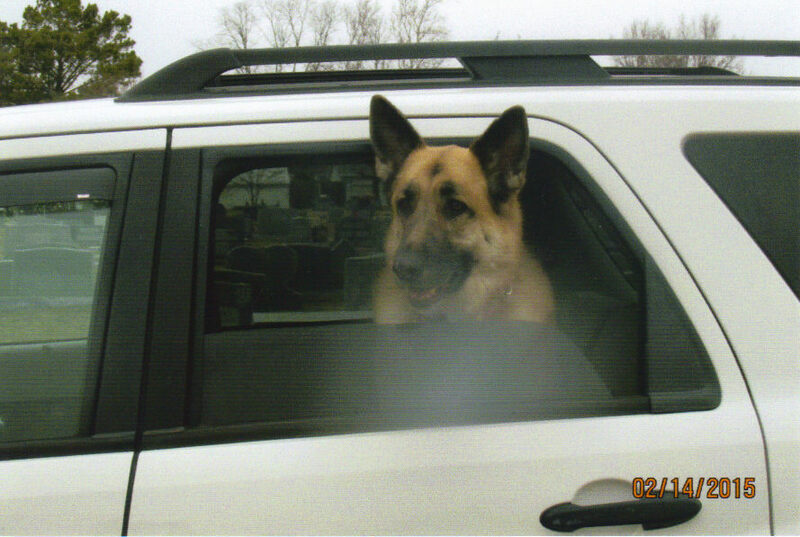 She loved rides in the car, and I could take her for visits at friends’ or my grown children’s’ homes. We’d occasionally drive over to places like Lake Montebello so she could have a change of scenery on her walks. Penny wore bandanas/collars for every holiday & season. I teach music lessons in my home, and she loved greeting my students & walking them to the door afterwards. 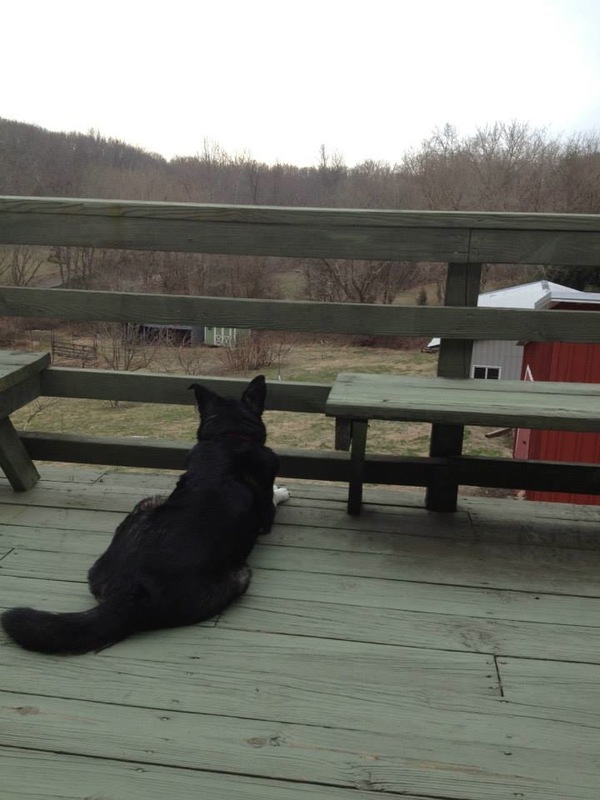 She also loved to hang in my fenced backyard, with or without me. The only issues thru-out were occasional bouts of severe diarrhea, which started a month after I got her. My vet placed her on prescription dog food (ID Science Diet). 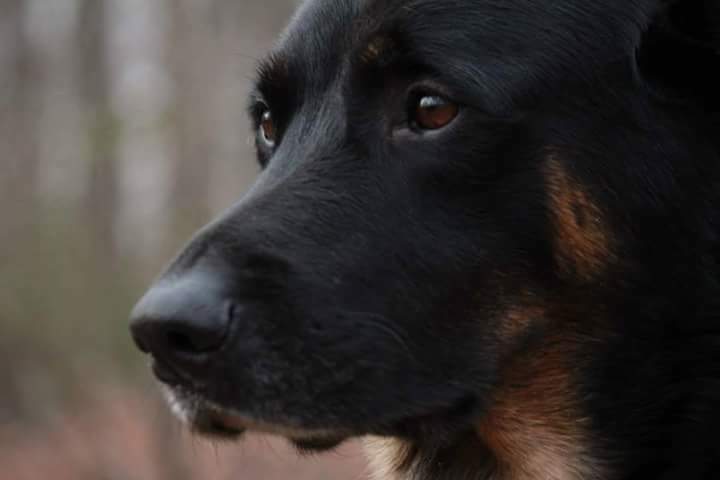 My previous shepherd (also from MAGSR) who I had for 10 years, was on the same food. 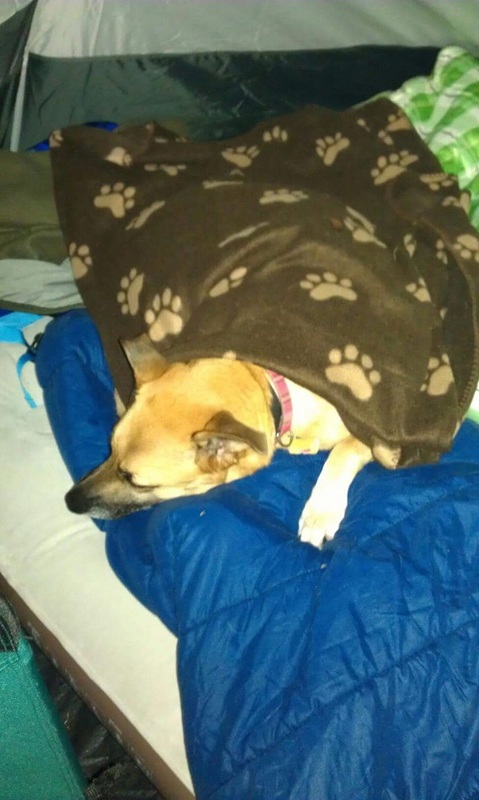 Penny would be fine for a month or two— then suddenly have an “attack” of diarrhea in the house. It would come on very suddenly---she didn't have time to ask to go out. 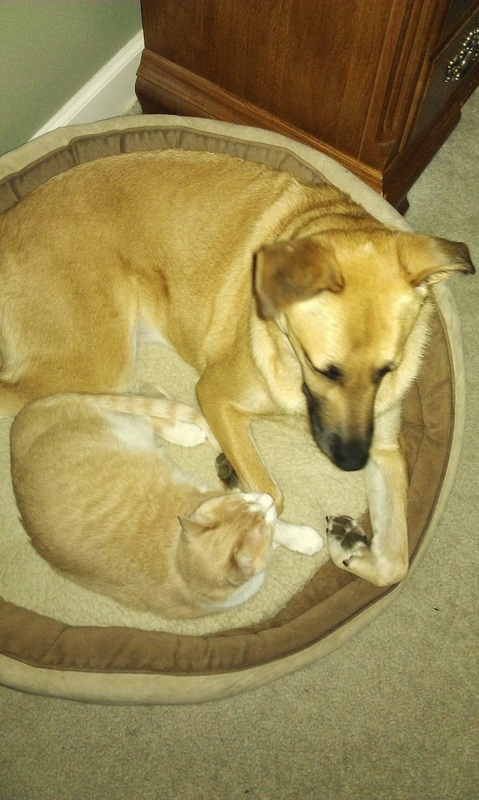 I usually took her to the vet ASAP; he’d give a shot to stop it, then she’d be on medication for 10 days. They attributed it to having a sensitive GI system. I never gave her people food—just an occasional dog biscuit. Oct 21st 2017 she became very very sick and had to go to the emergency ER she deteriorated very quickly. 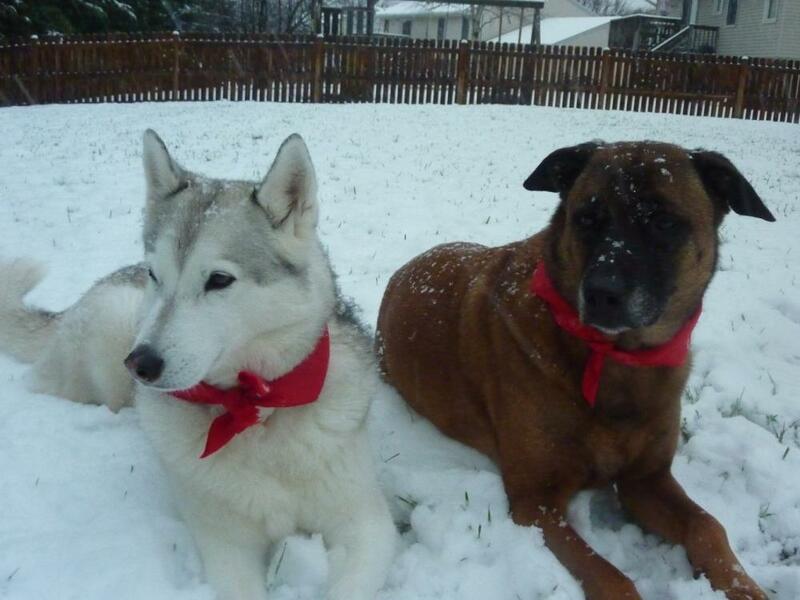 While I couldn't think of getting another dog--now it's been well over a year--- I still miss the companionship. 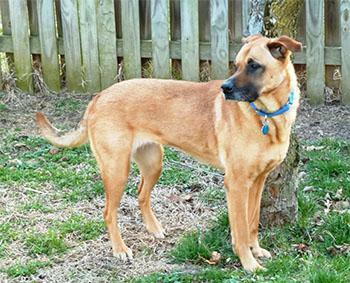 Around 7 years ago when I volunteered for MAGSR, fate led me to foster and then adopt Anna, a gorgeous shepherd mix who was 5 at the time and quickly became part of our family. 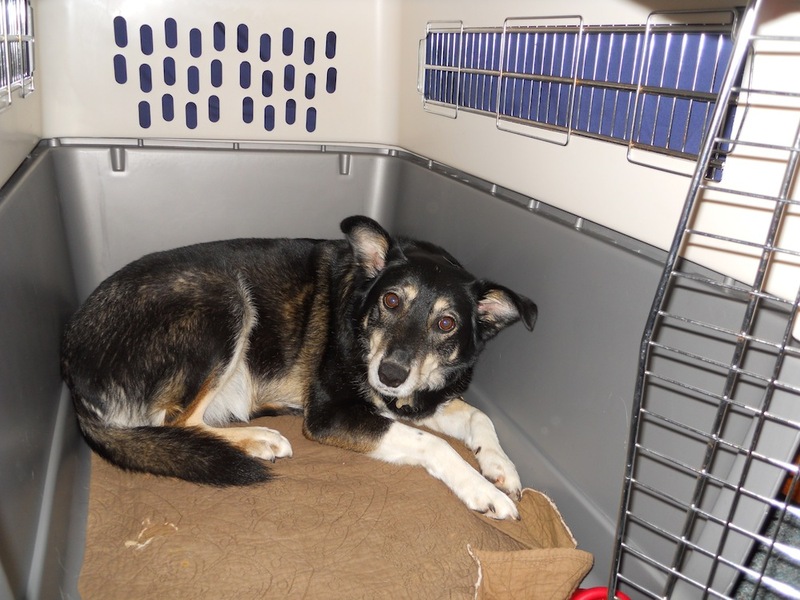 Anna had some fear issues in the beginning, but before long we helped her she overcome them and she became happy and very confident and a wonderful part of our family. 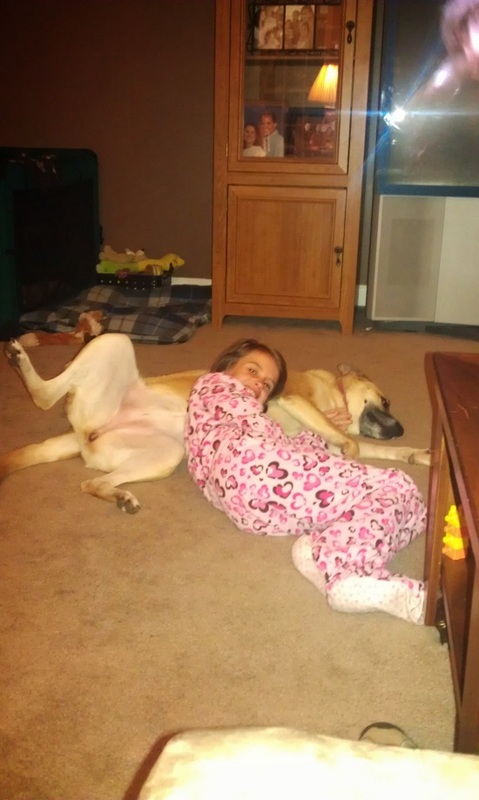 The years went by (too fast) until this April when Anna had several seizure-like episodes. Investigation into these incidences led to various tests and a CT scan which revealed a relatively rare cancer- thymoma- a slow growing cancer of the thymus, a gland on the heart which affects the lymphatic system. We decided to have the surgery to remove it as she was otherwise very healthy for a 11-year old and it looked as if the surgeons would be able to remove it all. Once the surgery was complete, they unfortunately discovered that it had spread to other places and they were not able to get all of it. We knew thymomas were generally slow-growing so we decided to put her on steroids to slow the regrowth as I didn’t want to put her through the side effects of chemo or radiation during whatever time she had left. We had no idea how long it would be before it would come back, but I knew it would be devastating- I just had no idea it would be so soon or so devastating. This Tuesday the 19th of October, 2017, we said goodbye to Anna- she suddenly began having issues over the weekend and we discovered on Monday that her cancer had returned in the form of at least one large tumor in her chest- one that was not there only a couple months ago. 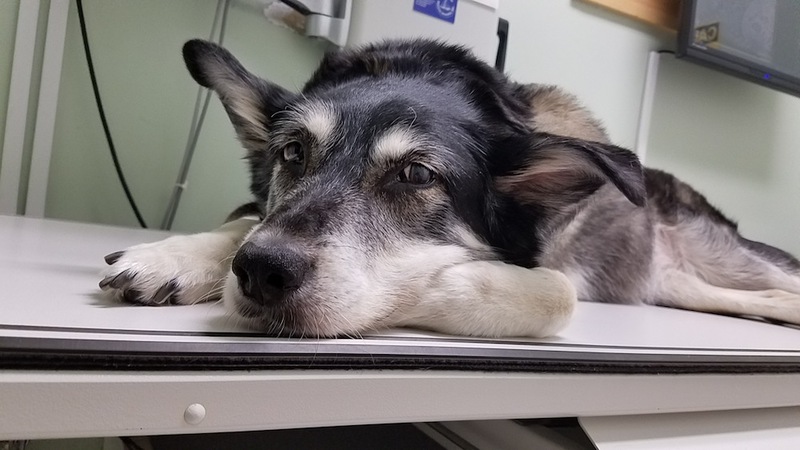 When we awoke Tuesday morning, she refused to eat anything, including her pain pills or treats, and her jaw was so sore that I couldn’t possibly force her to take them. By then, both sides of her face had begun to swell and she was beginning to have trouble breathing. Although I wish I could have kept her with me forever, I knew I couldn’t be selfish and she was telling me that she had had enough. She was in pain and there was nothing I could do for her except let her go. 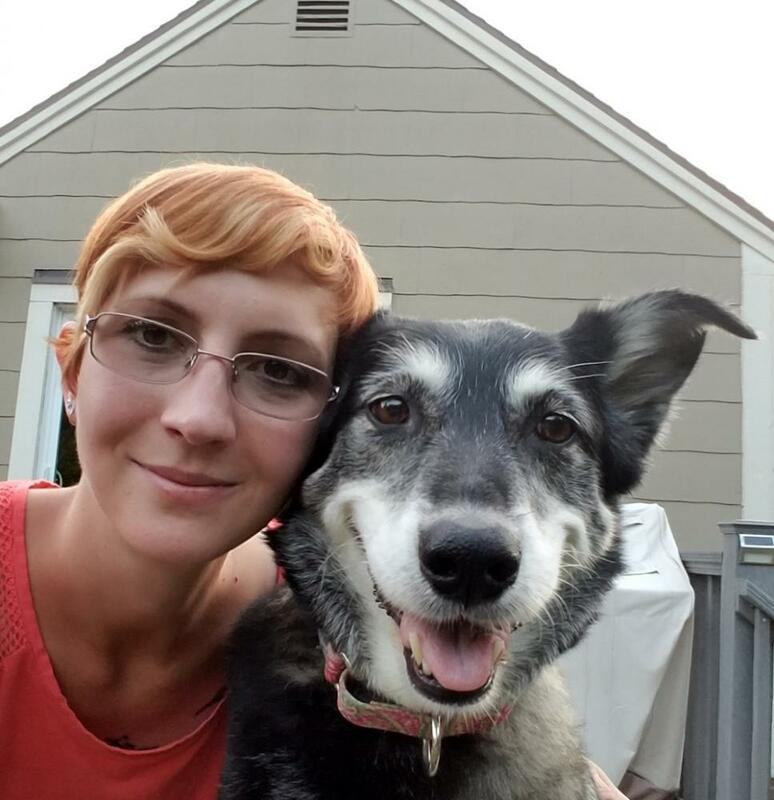 She was my constant companion and although I very much love my family and my other furry ones, she and I had a bond that was just different than any other. I feel as if a part of my heart and my soul has been ripped away. She was such a good girl and truly didn’t deserve to be abandoned by her former family and to have cancer take her at the end of her life. I am only so lucky and grateful to have been there for her in between- but what’s more is that she was there for me. Never judging, never disappointed in me, or angry with me. She was there when I was sick or in pain, and when I was sad or stressed- which unfortunately has been a lot lately with my own health issues. She was never pushy, and always knew when to come to me and give comfort. Even in the final moments before she took her last breath, she was nudging me and worried for me as I cried over her. I can’t really remember what my life was like before she became part of our family, but I know it will never be the same. She was the sweetest, bravest, sassiest, bossiest, fiercest, most loving and stoic creature I’ve ever met and I know that there will never be anything like her in my life again. I can only hope that there is indeed a “Rainbow Bridge” or a Heaven where someday, somehow, I can see her again. Until then I will keep her memories inside my heart, as painful as that may be. Thank you MAGSR for all you do, and for giving me the opportunity to have such a wonderful girl be such a huge part of my life. 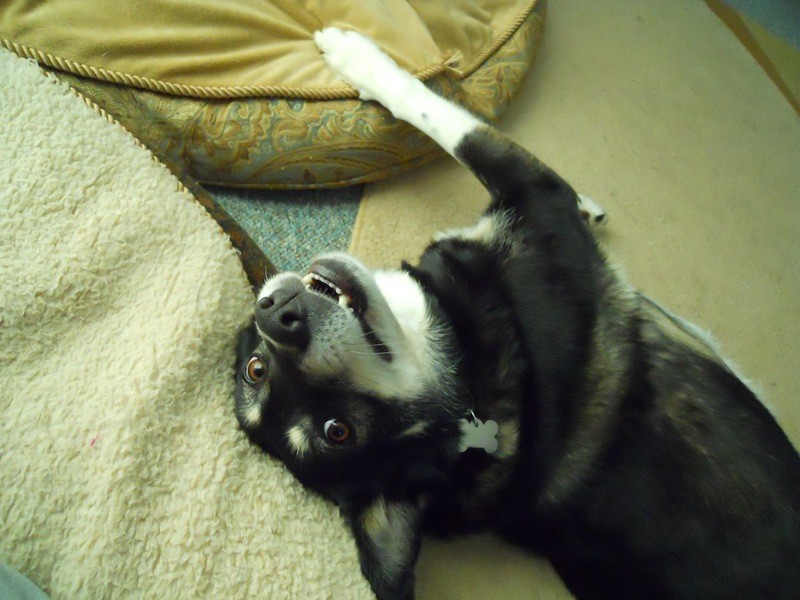 Not that long after adopting Sadie (changed to Suki) she came down with oral melanoma. Despite the best in oncology care & the latest immune therapy, she died on October 6 of 2017. I was broken hearted. The first photo is shortly after she arrived. She had a slight limp so her orthopod fitted her with a shoulder brace & prescribed limited exercise for a few weeks. She loved the park so she is being strolled through it. The next photo is very shortly before she died. 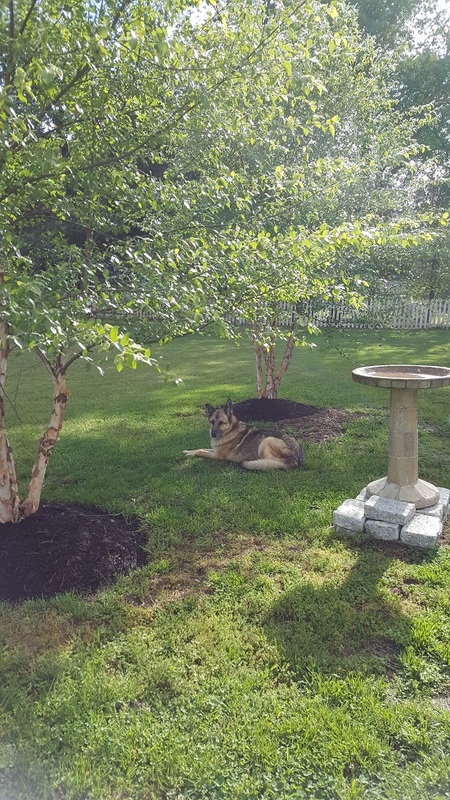 It all started with a random trip to our local PetSmart in Waldorf one weekend, when we came across a table setup with MAGSR information and GSD representing by the name of Mosby. We had never heard of MAGSR, but soon discovered what you were all about with a wonderful volunteer, Ms. Susan Palmer. 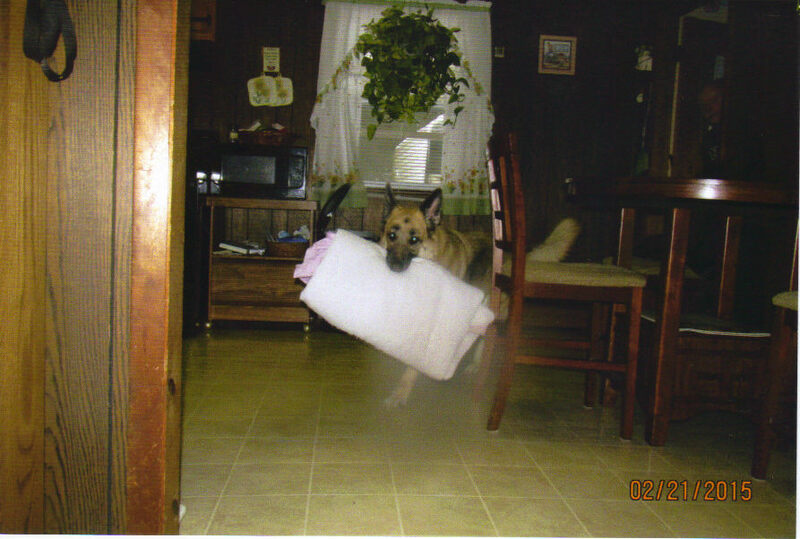 We looked through a notebook of photos of GSD's that needed a fur-ever home to call their own and we were HOOKED! We filled out the application and waited anxiously for the call and home visit. 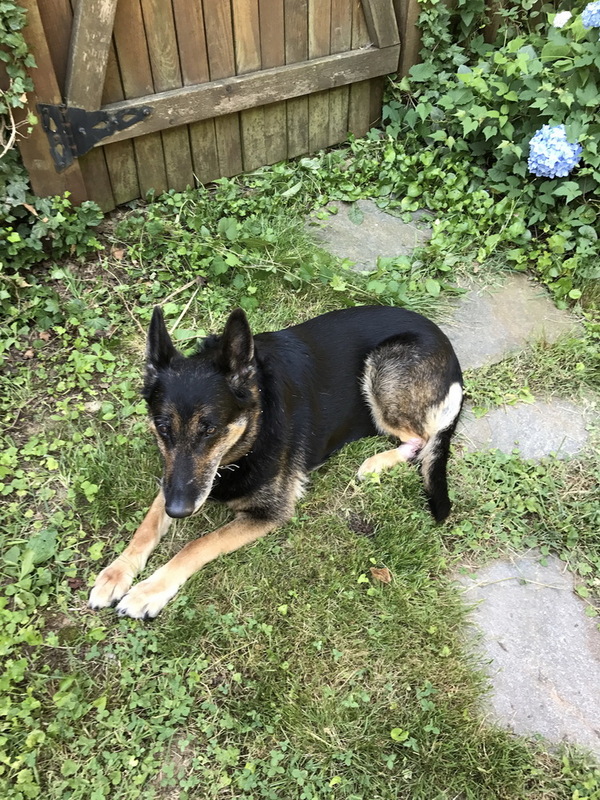 When we finally got the green light to come see a few doggies, we went up to the kennel with the intent to adopt a young GSD, but our son wanted to see an older GSD by the name of AJ!! He was believed to have been 5 yrs old. The person that was showing us AJ asked me if I wanted to give him a treat, I agreed a bit reluctantly because AJ was such a BIG boy. She gave me the treat and told me to lay my hand flat, AJ came over and took my whole hand into his mouth, my thought at that very second, was where is the nearest hospital! He was the most gentle giant I had ever come across and at that very moment I told my family we did not have to look any further, AJ was the one! 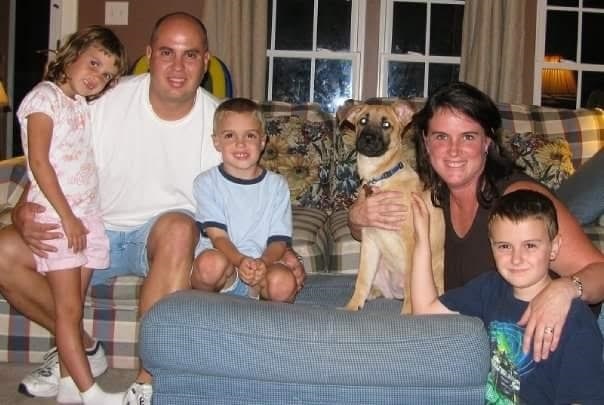 So on February 11, 2012 we adopted our 2nd son. AJ quickly became part of our crazy world. He loved going to the park in Marshal Hall and chasing the geese. He went to travel baseball games with us, but his all time favorite job he had was going on WALKS! If he saw us open the drawer where we kept his leash he would go crazy and spin in circles. He had and shared the love of Rotisserie Chicken with me every time I would bring one home (LOL). He was a gentle giant. AJ gave us all so much over the short 5 1/2 yrs he was with us. He got along with small dogs, big dogs, any human; he didn't have a mean bone in his body. He could never be replaced, he was simply AMAZING and AWESOME in everything he did. With great sadness and very broken hearts we had to let you go on 9/25/17. 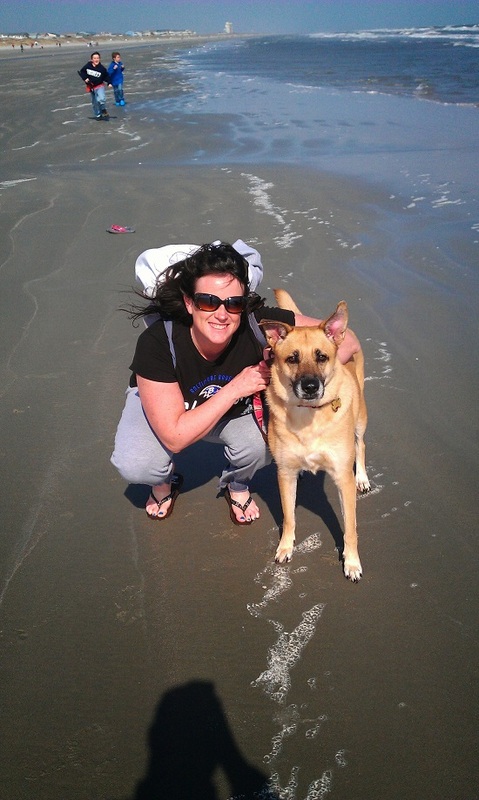 AJ had Degenerative Myelopathy, a disease that affects the spinal cord. At the end we were carrying him in and out of the house. 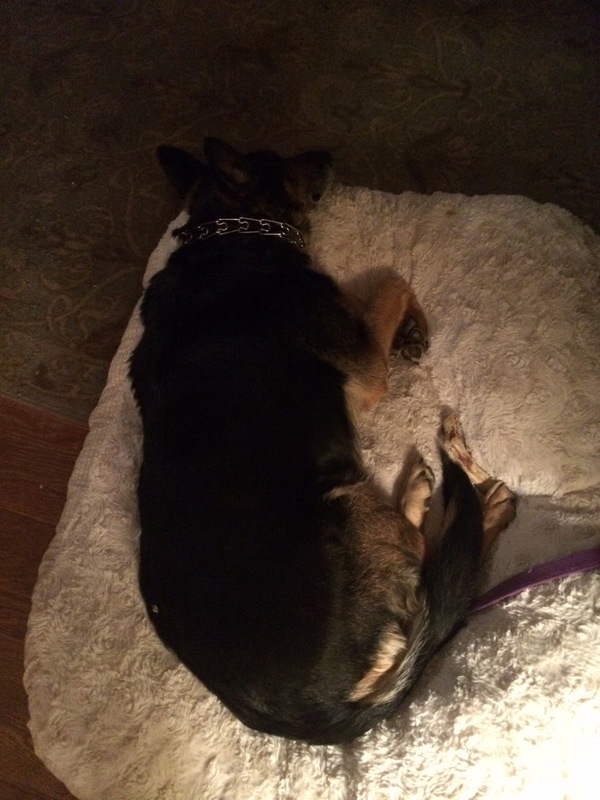 He could no longer stand to eat, stand to go to the bathroom, or take his beloved walks. His quality of life had escaped him. It was the hardest decision we had to make to let him go, but I know we made the right decision. Our hope is that he enjoyed his time with us as much as we enjoyed our time with him. He was a Blessing to our family and we enjoyed the all to short journey with him. He was a gentle giant, an over sized teddy bear. He gave our family so much and asked for so little in return. We will fur-ever love you to the moon and back AJ, "until we all meet again!" It's with a very heavy heart that I am writing this email to you all today. Our beloved family member, Icarus, left us on Monday, August 28th. 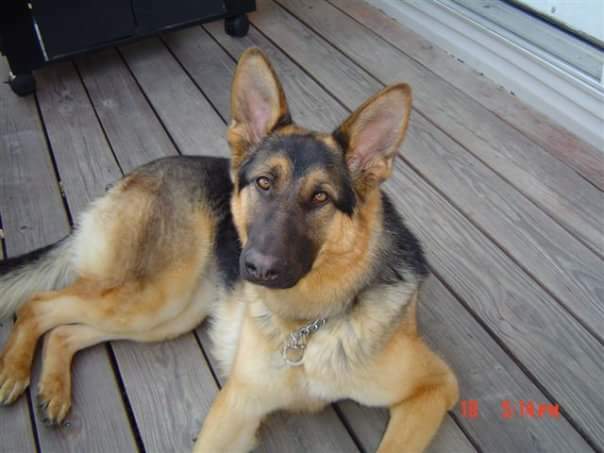 He was our first MAGSR pup adopted back in January 2006 (when his name was Zorro) and was a beautiful, sable colored boy who had the most amazing temperament. 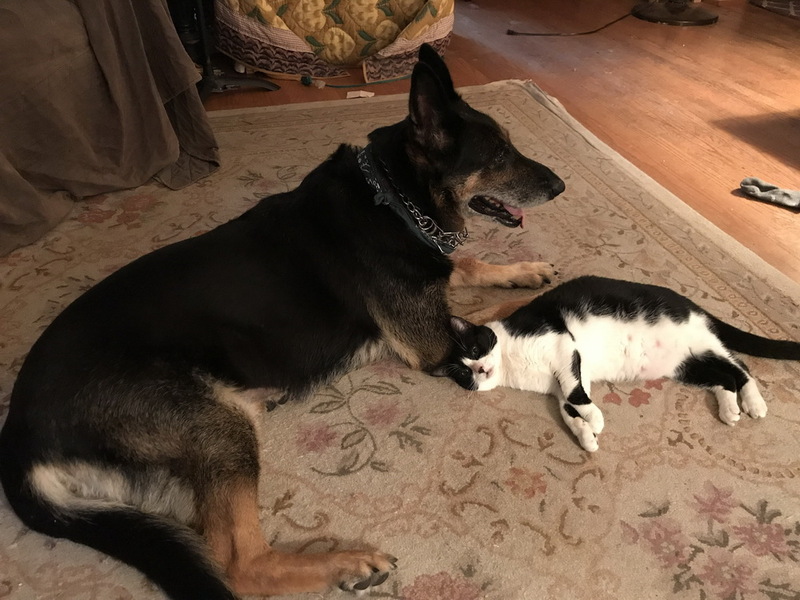 He immediately took to our female GSD mix Scout and they became the best of buddies. Icarus was a huge part of our lives for close to 12 years and saw us through so many life events including marriage, babies, and growing boys - and we couldn't have asked for a more amazing companion on this journey. 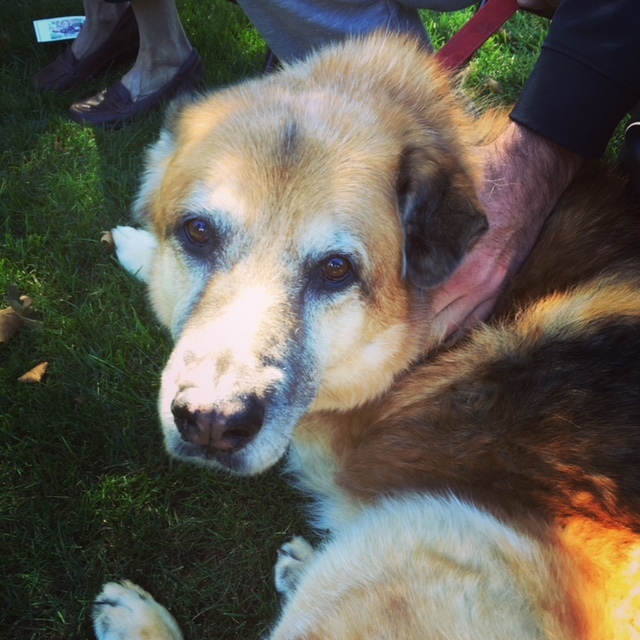 He was gentle, sweet and loved both people and dogs alike. He wasn't the brightest, but he made up for it with his amazing personality and truly stunning good looks! 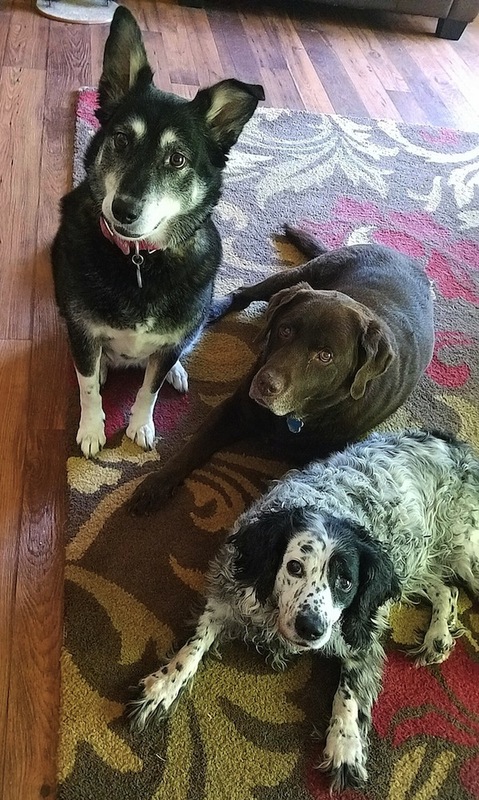 When we brought our most recent pup home from MAGSR in 2013 (JR now Nikko), Icarus warmly welcomed him into the house and bestowed tons of attention and licks on the younger dog. 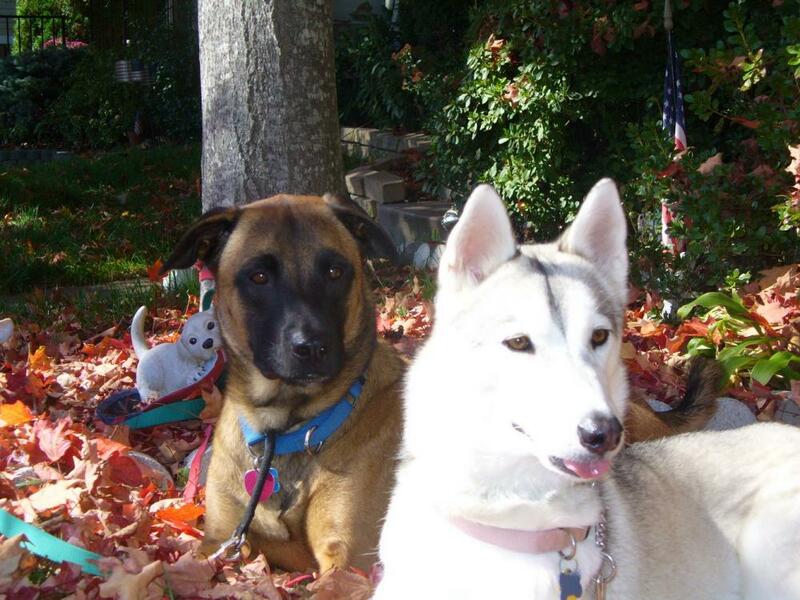 They were great playmates and Nikko helped to keep the aging Icarus young at heart. We miss our Icarus dearly and the house seems different without our big loveable guy around. Thank you MAGSR for allowing this wonderful dog into our home and our hearts. He will not be forgotten. I am very sad today. My beautiful fur companion passed over the Rainbow Bridge. It was quick last Wednesday she came down with a fever and it did not respond to antibiotics. An ultrasound was done today which showed cancer in the spleen stomach and nodules in the liver. 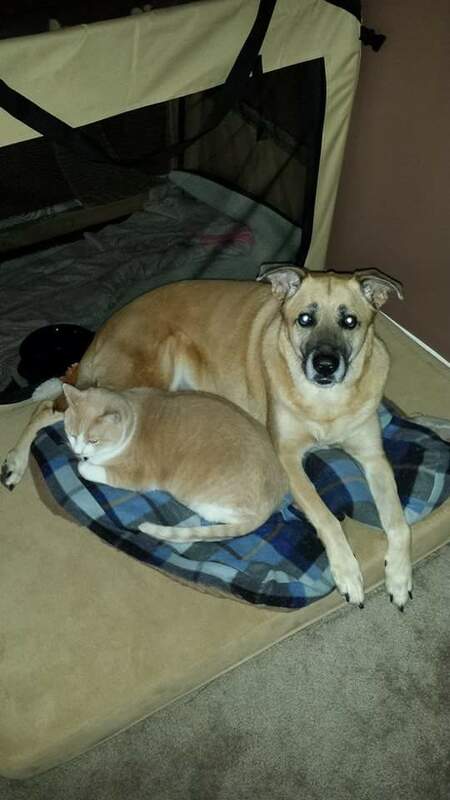 She was glued to my side for the last 4 years.I am going to miss my baby girl dearly She was about 10 yrs old and still had some good years left in her if the ca didn't get her.2 days before she fell sick she was running around with a fox that she became friends with. Just about every morning before day break she would hurry down to the stream and her and the fox would play . This has been going on since March. Then she would meet up with a few of her other furry friends a hound dog,Shitzu,a laso and a mut .We walked several miles with her friends. She was quite THE LADY. Sierra loved getting groomed and getting her nails painted. and being a typical women she loved to shop. She would walk around Pet Value or other stores looking and smelling but wouldn't grab anything until I said "Get your treat" then she went to what she had picked out . She was amazing. I'm glad that I could work with her and give her a nice home for 4 yrs. She was an amazing companion. Hi there. We adopted Kyla from you all back in 2001. She crossed over yesterday evening. She had a beautiful life. When we got her, all we knew was she had been left in an outdoor pen in all her own mess. I believe she may have been one or two years old when we got her but her age was not for sure. 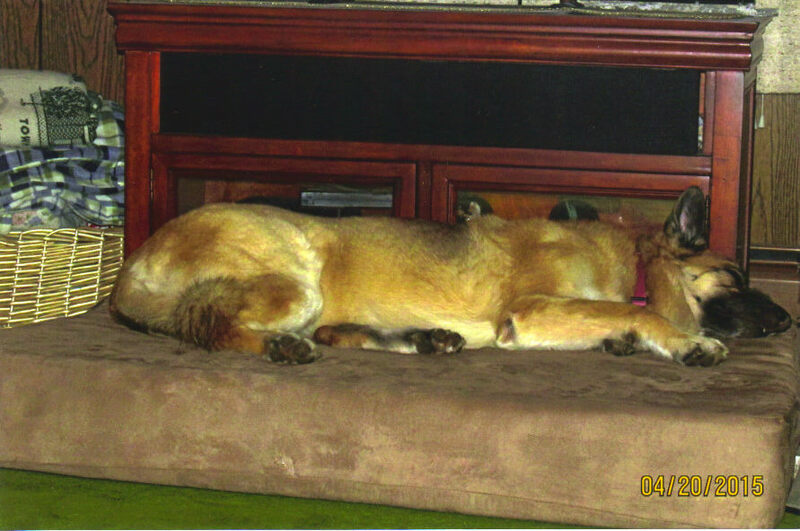 Kyla had the sweetest disposition and not a mean bone in her body (except for the UPS man/truck when she was younger). She was our family dog but she was mine or better yet, I was hers lol. Where ever I was, she was. She also loved her dad when he came home from work. 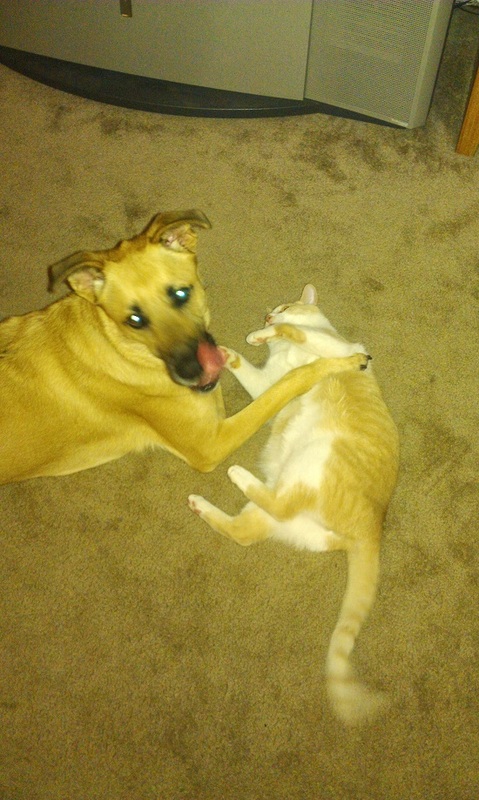 She used to bring him toys shaking them in her mouth to him. My friend's dog had to teach Kyla how to play with toys when we first got her because she had no clue. As for our girls, she used to wait for them to come home from school at the door. Kyla really blossomed about a year after we had her. She had always been skittish and definitely afraid of any other man (other than her dad). I brought home a kitten. His name is Shadow. 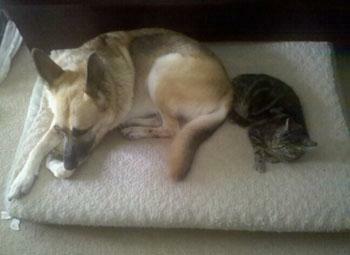 She took this kitten and treated it like it was her own puppy. 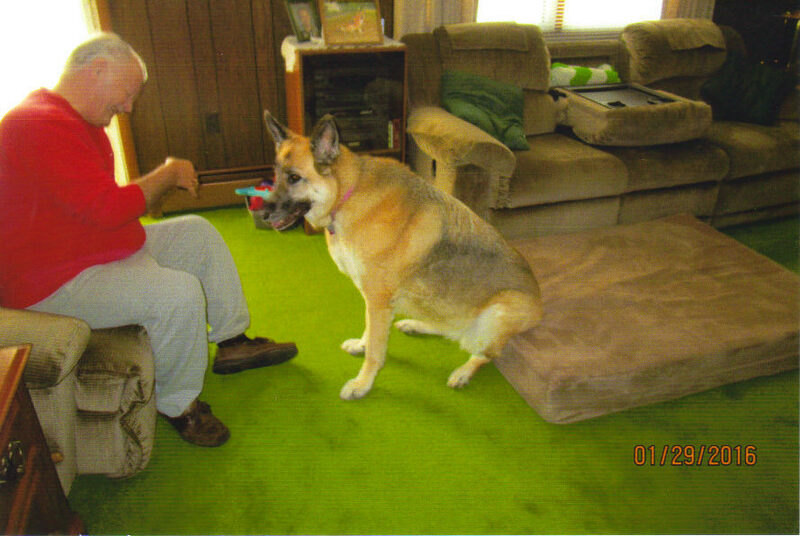 Even up until she passed, they had a special bond. We have two other cats as well. 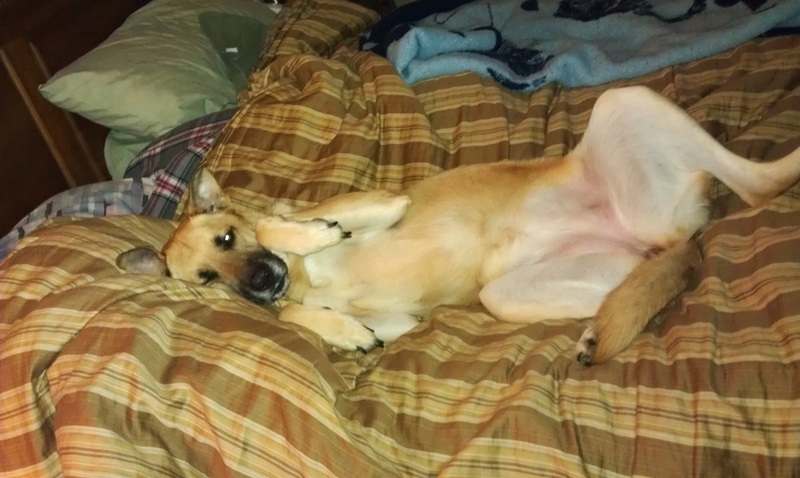 Well, last night, Shadow came onto our bed, went over to my husband's side, stood there for a minute looking at the floor where she would lay. He jumped down, sniffed around and jumped back up on the bed. I fully believe he knows. As for the other two cats...they seem oblivious. Before we were leaving yesterday evening to take her to the vets, I went out onto our deck (which is enclosed in plastic except for ventilation holes on the sides). On the deck was a butterfly (same coloring as Kyla). 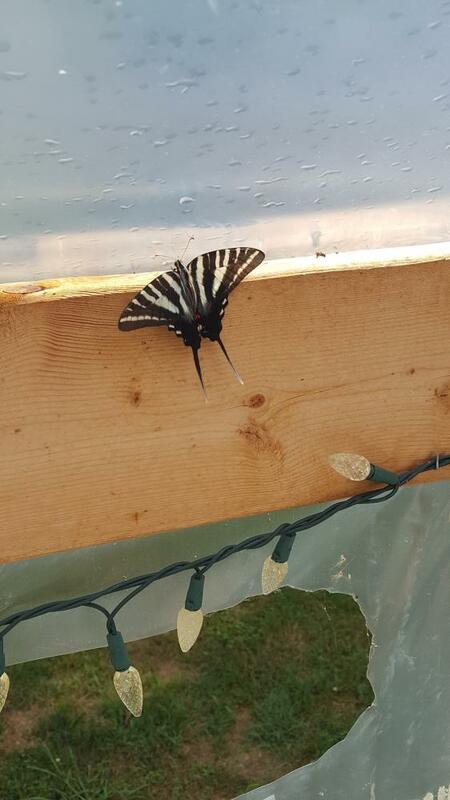 I released the butterfly off the deck. 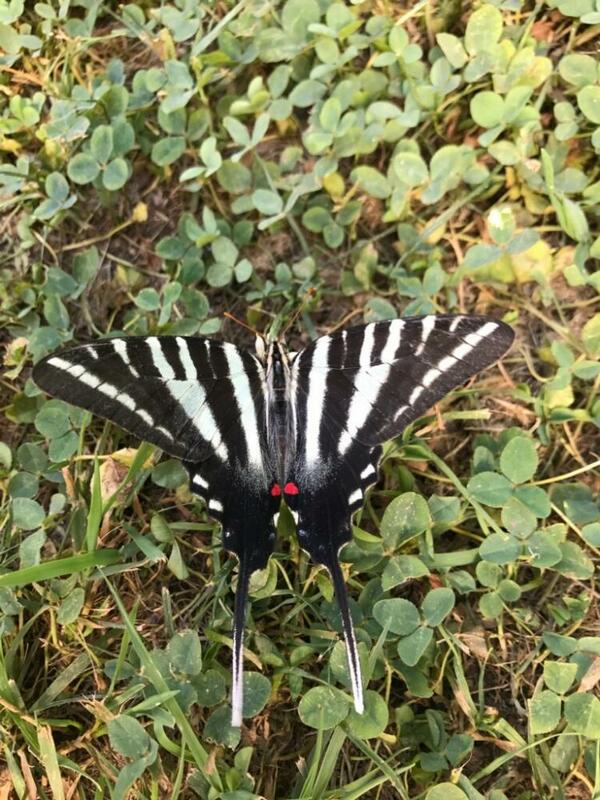 This morning, the same butterfly was in the yard. I don't think that sign can get any more clear. She is going to be missed terribly. But she had a wonderful life. We may adopt again one day, but not anytime soon. She was a special girl. Thank you for allowing us the pleasure to have her in our lives. The first two pics are when we first got her. The next pic is in later years. Then the butterfly pics are from last night and this morning. 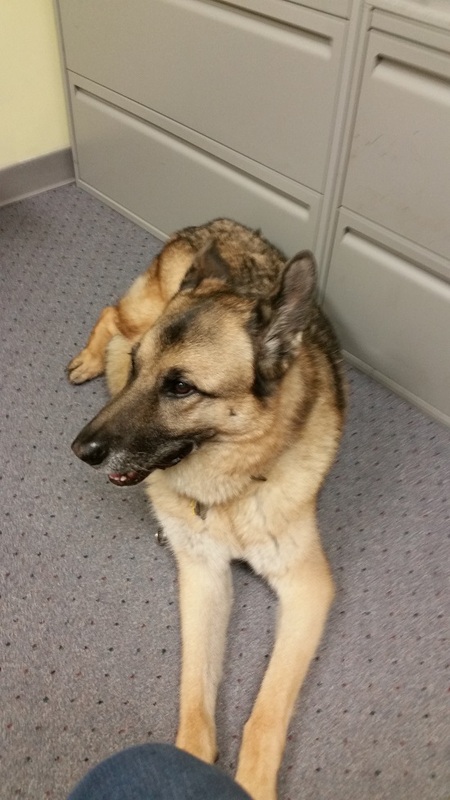 We are heartbroken to report the passing of our beloved GSD Piper over the bridge. She came to us via MAGSR back in 2004 when we still lived in Maryland. 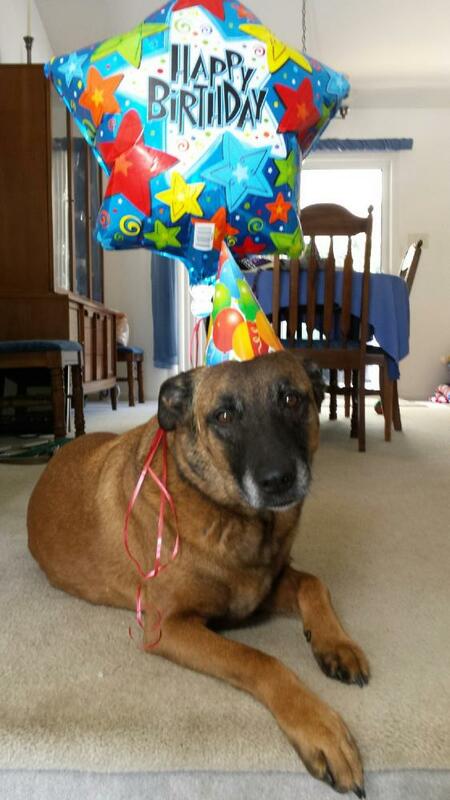 Twelve years ago we took a chance and welcomed this young, undisciplined puppy into our lives. She was a Tasmanian devil of cartoon fame (for which she earned the nick name 'Hyper Piper') and she never ceased to amaze us with her boundless energy or her ability to try our patience. To put it bluntly, she fit right into our household. And yet, what she lacked in discipline she more than made up for in the undying love and affection she gave us these last 12 years. It was a love that knew no boundaries and an affection that was as infinite as her beautiful and gentle soul. When she wasn't begging to catch frisbies, tossing her bed around, or making a run for a quick swim in the pond, she would thrust herself into our presence as a way of saying “Pay attention to me!” And when she got that attention, like any dog with a bone, she held on to it until SHE decided it was time to stop, always with a trademark "harumpf". Our house and home will seem a bit larger now without her incredible love that so greatly filled it. 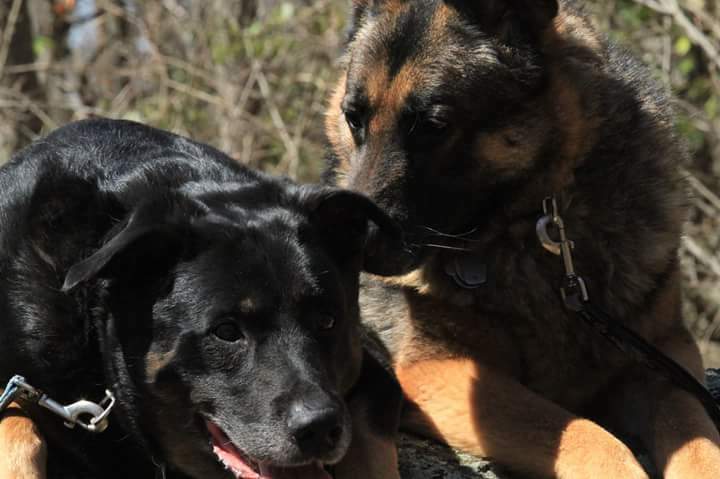 She is gone now beyond the vale to play with her pack brother Baxter, but her love and spirit will never be far from our hearts. 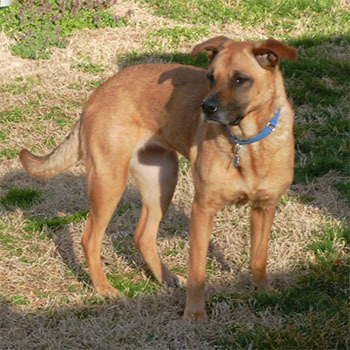 My husband and I adopted Riggins on April 29 2007. He instantly fit right into our family. He had so much personality. He won 2nd place in obedience training, went on to tracking training. Riggins was the most polite well manner companion until he felt my husband or I might be in danger. Then he was right there. I could share so many wonderful stories about Riggins, but I will keep it short. 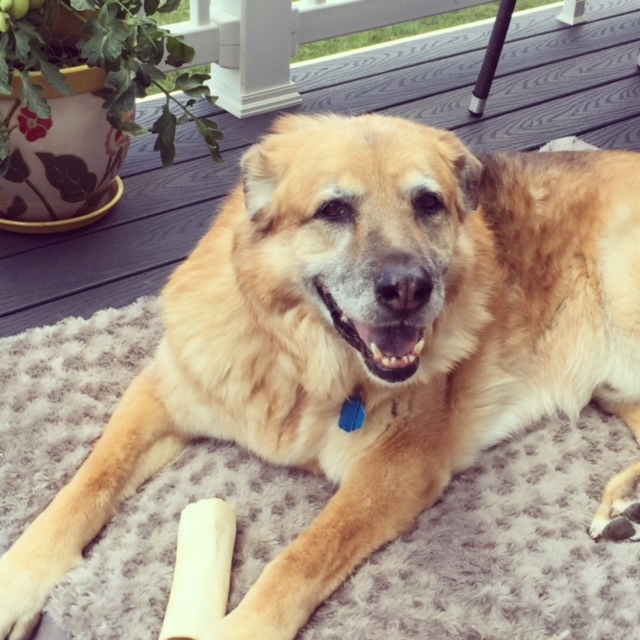 The most important reason I am sharing this is to thank you for connecting us to a forever friend. Thank you giving us the ability to spend 10 amazing years with the best companion ever. We lost our buddy Riggins on May 25 2017 due to health issues from DM. MAGSR we thank you for what you do. It’s only been 6 weeks since we lost our Basil and it seems like forever. 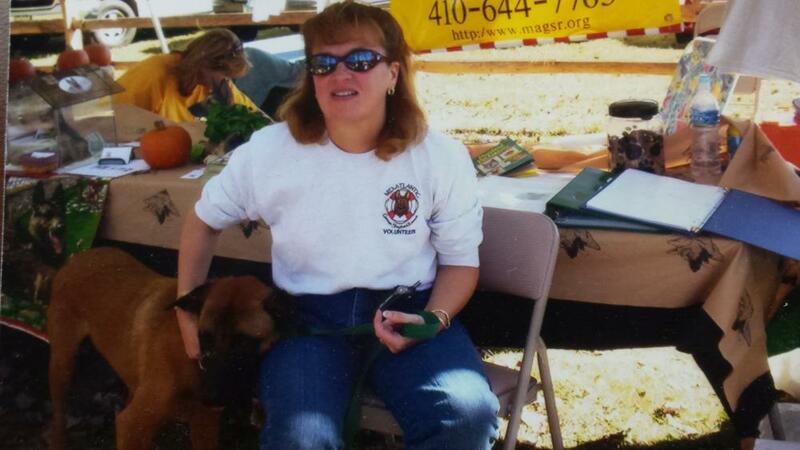 I met my Basil at the Reisterstown Festival in Sept 2007. I fell in love with him the moment I met him, but I was going on vacation in October and I didn’t have anyone to watch him. When I returned, I got in touch with his foster to see if there was anyone interested in him. When I found out there wasn’t, I knew he was going to be mine. It was fate. He was a baby and had lots of energy and I couldn’t seem to tire him out. He was wearing me out though. So after a few months I decided he needed a sibling. 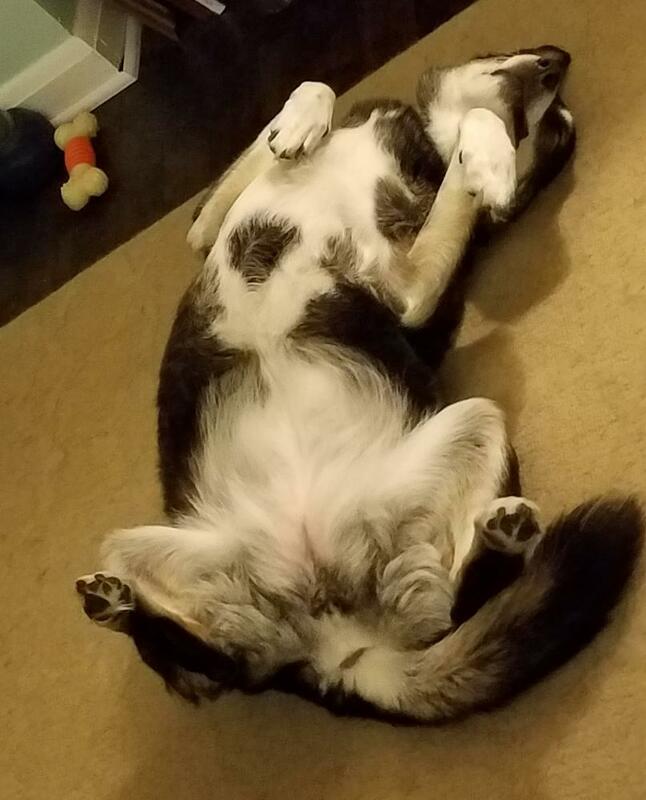 Then I received an email from a friend, that a Husky needed a new home. We went to meet the Husky and Basil seemed to like her, so we piled in the car. On the way home Basil started a fight in the back seat. We got home and everything was fine for a little while but my Basil would start fights with her on occasion. He was wondering when she was going home. When he finally realized Kesha wasn’t leaving he decided to love her instead of fighting with her. You could tell him to go give Kesha kisses and he did exactly that. 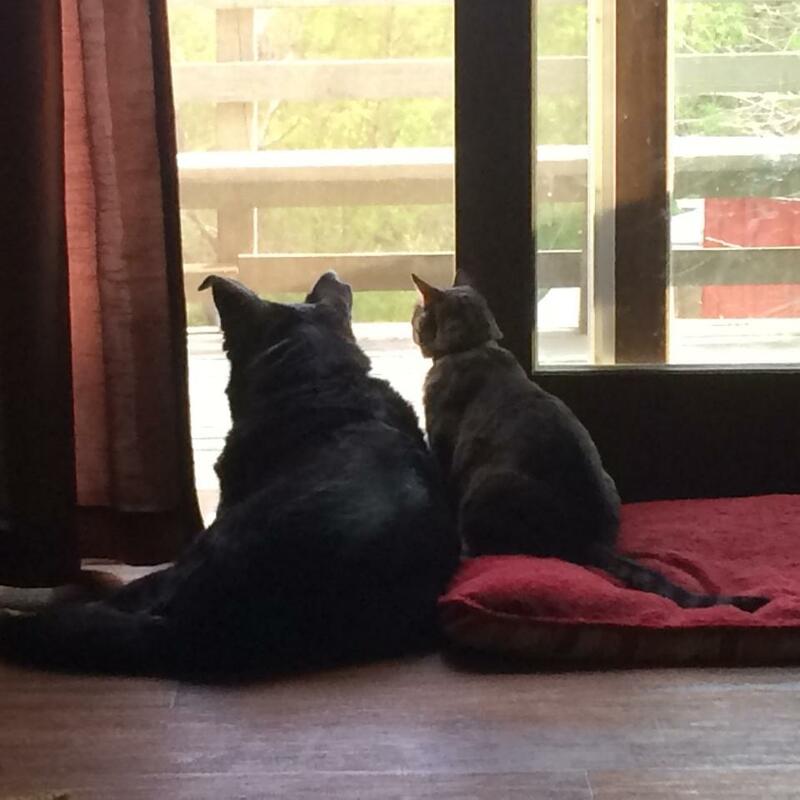 They became best friends and were pretty much inseparable. Basil was a huge part of my life. He was such a special dog. He was with me all the time. Then when I met Mark, Basil became special to him too. 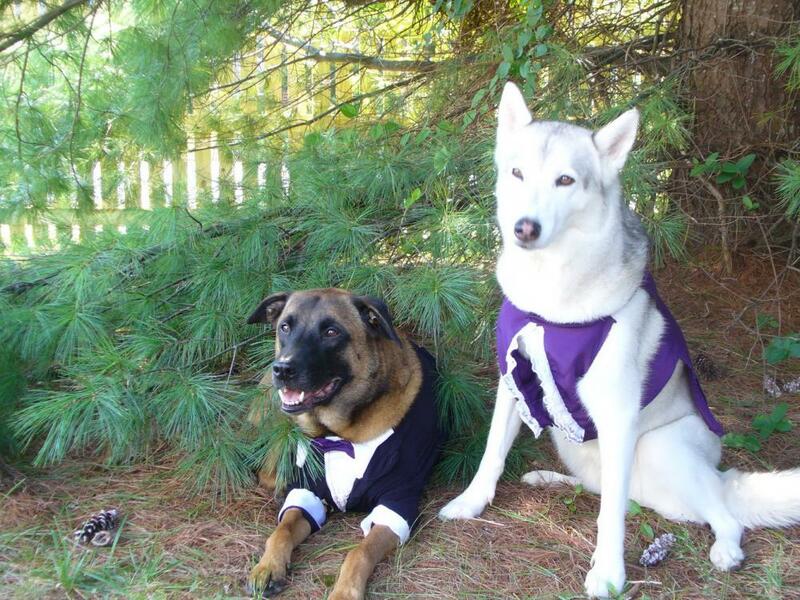 Both Basil and Kesha were in our wedding pictures. Basil loved his toys, especially new toys. Whenever he got a new toy he would play only with that toy for a while, as if he was saying 'thank you, I really like this' . 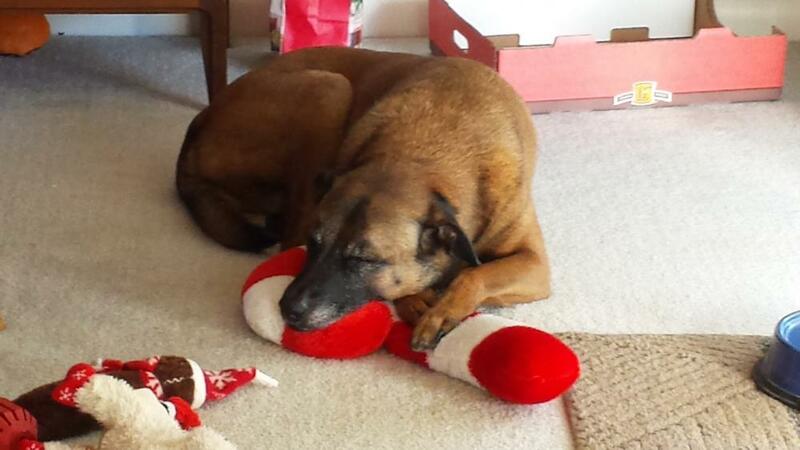 He loved them so much he used them as a pillow to take a little nap. Everyday he met me and the front door with a toy in his mouth. He was a smart little boy. Did you ever see a dog bring his toys back inside from the yard? My Basil did. “Basil go get your toy, bring it inside”. And he would. He would do anything I told him to do. He was such a good and smart boy. He was also a creature of habit and loved to stay on schedule. He would get so upset with me when I strayed from that schedule on the weekends. My Basil definitely understood comfort. 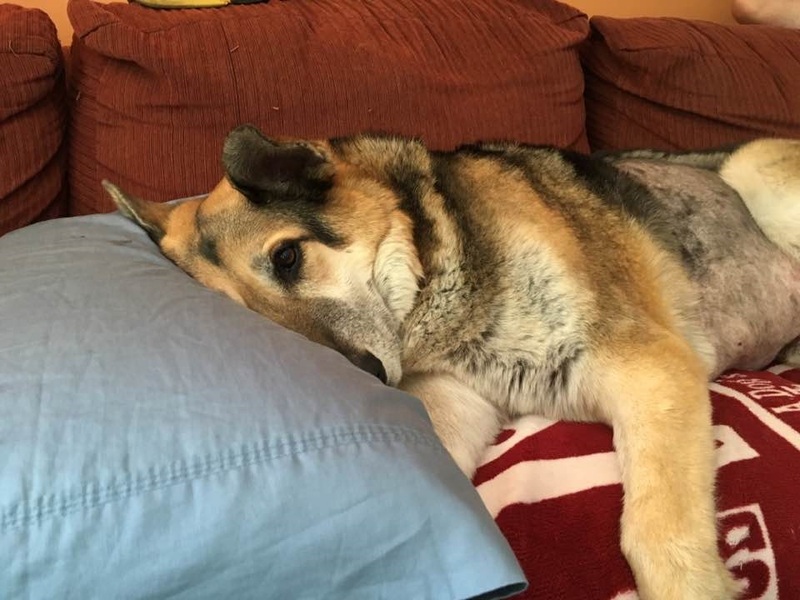 He loved to sleep in bed with his head on a pillow just like a human. I don’t think Basil knew he was a dog. Basil loved my Mom and Dad. He knew them as Mommy and Daddy and would get so excited when I told him “Mommy and Daddy was coming to see Basil”. He would run to the window and look for them. Basil had so many people that cared for him. He was such a loving dog. My Basil had many nicknames and would answer to all of them: Little Man, Angel, Baby Boy, Baby Doll, Brown Dog and Boom Boom (since he was scared of anything that went boom). My little boy would get so upset when it thundered and when there were fireworks. 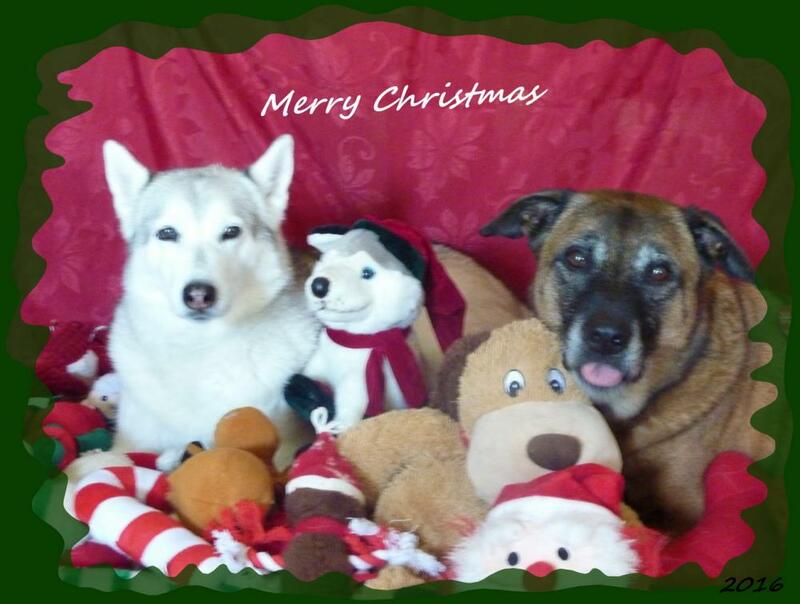 I tortured Basil and Kesha by dressing them up every year for their birthdays, Halloween and for their Christmas pictures. And they both went along with it. Basil actually loved getting his picture taken. He was like my child and I would have done anything for him. My Basil stopped eating which was very unusual for him. That was one of his favorite things. Within 2 days he was diagnosed with liver cancer. We got a 2nd opinion and unfortunately it was the same. We were able to keep him comfortable with meds for just a little while. Just about a month later when he started having trouble breathing I had to make the hardest decision ever. I promised him when the bad days outnumbered the good days I wouldn’t let him suffer any longer. He was probably suffering longer than we ever realized, but when my Basil stopped eating we knew something major was wrong. We miss and love you Little Man…… RIP my precious animal! If love could have saved you, you would have lived forever!!! In Loving Memory of Dutchess, 04/18/2017. On this sad day Dutchess, a young, beautiful, girl passed over the bridge. 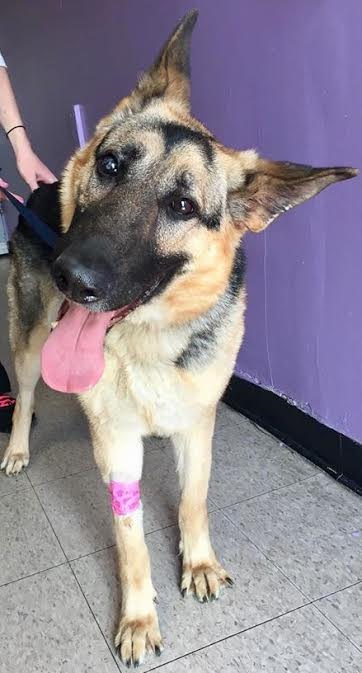 Dutchess came to MAGSR as a 2yr old GSD from a local shelter on 03/24/2017, a victim of alleged abuse. 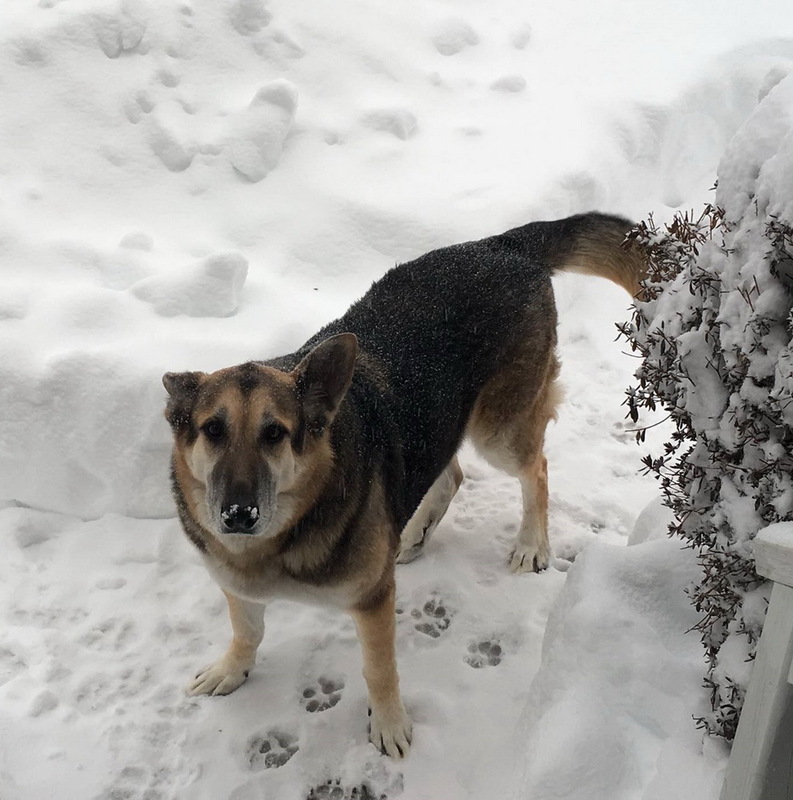 The abuse left her w/a slight tilt to her head & blindness in one eye; still when she came to us she was a trusting, happy dog, exhibiting the resiliency that dogs generally show. 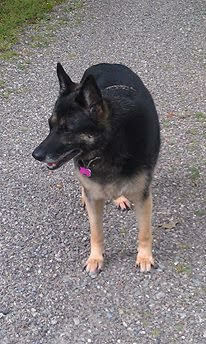 MAGSR says "Till We Meet Again" Dutchess, your life here on earth was much too short & hurtful. Go now, find all the MAGSR dogs that have preceded you, there you will find you can trust again, never more to be abused. You will be welcomed, loved & in a better place than you've known. 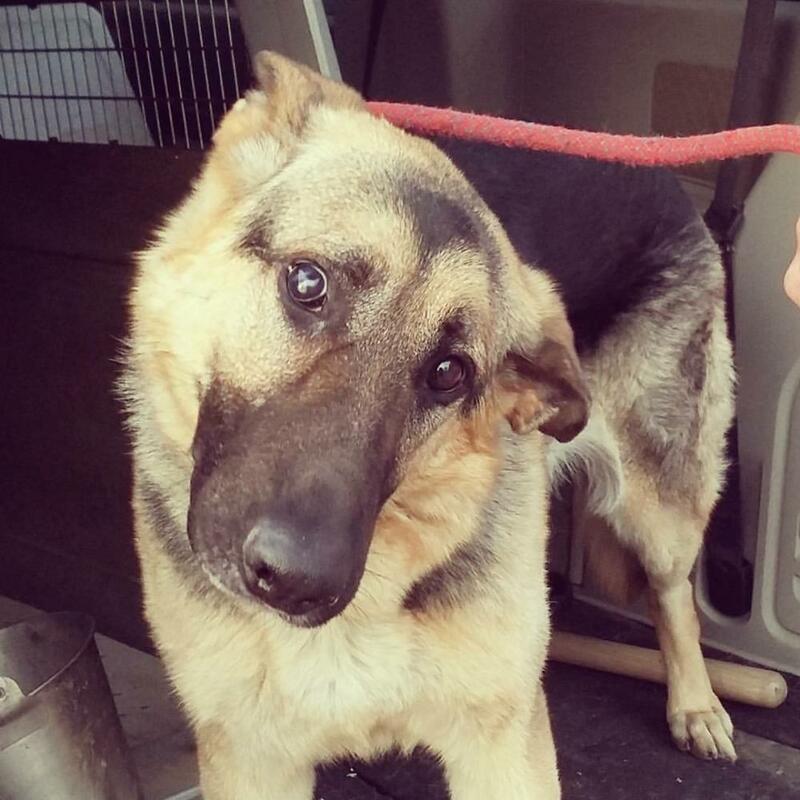 Beautiful girl, you deserved so much better than you received, Run Free W/Love, RIP Dutchess. I adopted Saydalee, or she actually chose my daughter and me, from an adoption event in 2002 when she was 1 year old. She and her brother had been surrendered because they weren't "cocker spaniels", and Saydalee was found to be quite a jumper. I had been advised that she shouldn't be left in a fenced yard if I wanted to keep her. 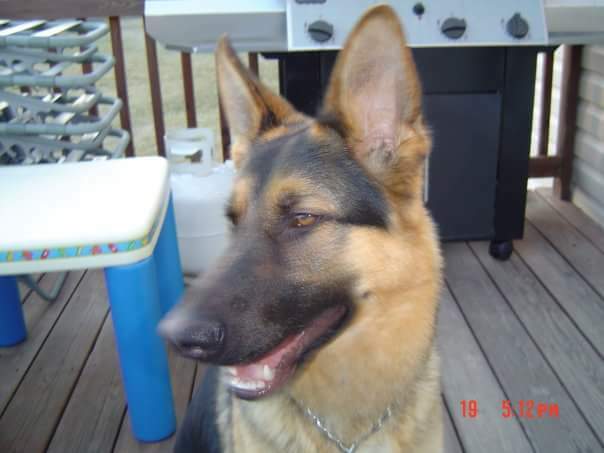 Saydalee was the largest dog I had ever had, and she kept me running, walking, and extremely happy for the past 14 years. She was the absolute best dog that anyone could have ever shared a life with, and I miss her terribly. 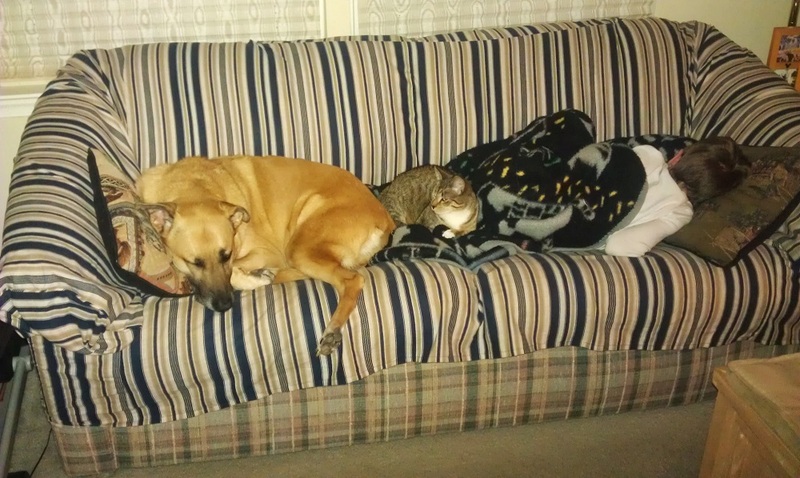 She made friends with everyone and every animal she met, even was step-sister to 4 cats. She gave me so many happy moments over the years, that it still hurts to realize that she is gone. 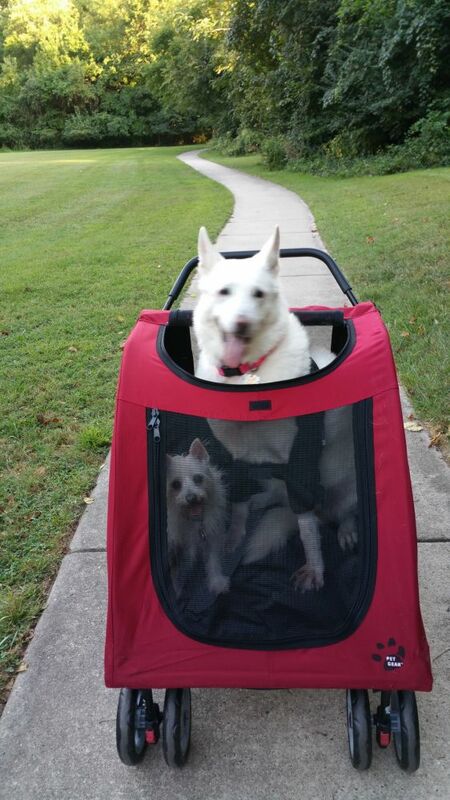 Although she had a torn ACL and arthritis had set in, she continued to walk with me up to a week before her death. She was pure heart. I was blessed to have her in my life. She went to the Rainbow Bridge to wait for me on Wednesday, October 5, 2016 at the age of 15 years, 4 months. Handsome Luke came to MAGSR beat down, with long nails and various age-related ailments. 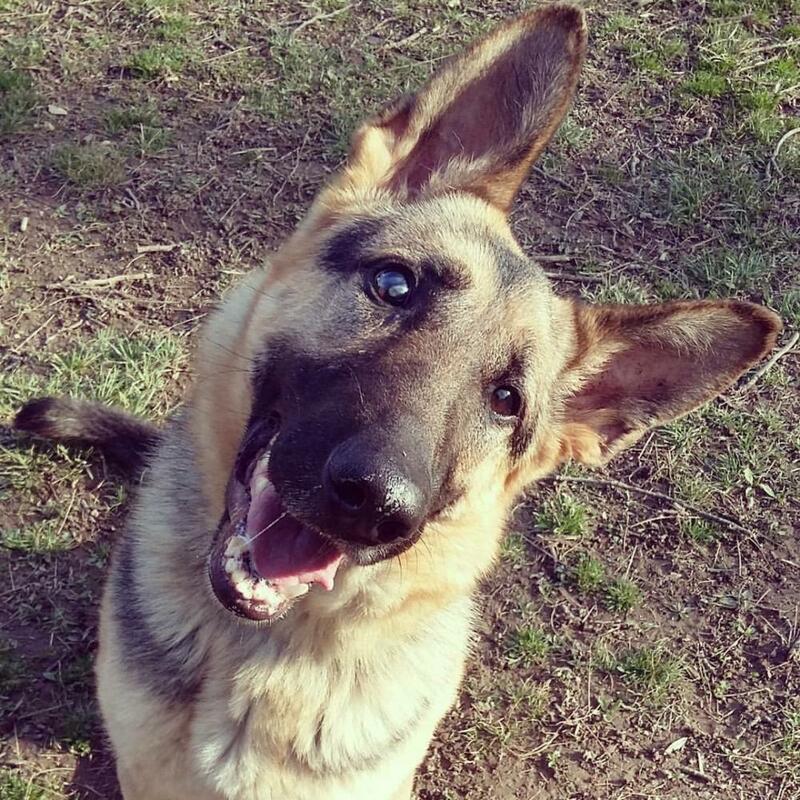 His life changed for the better once he came to MAGSR and his foster took him in. Recently, Luke was having increased difficulty to get around and started to react badly to those around him. 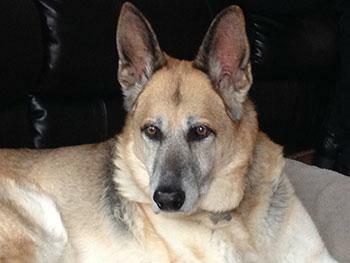 It is with sadness that we report Luke passed peacefully yesterday with his loving foster parents by his side. 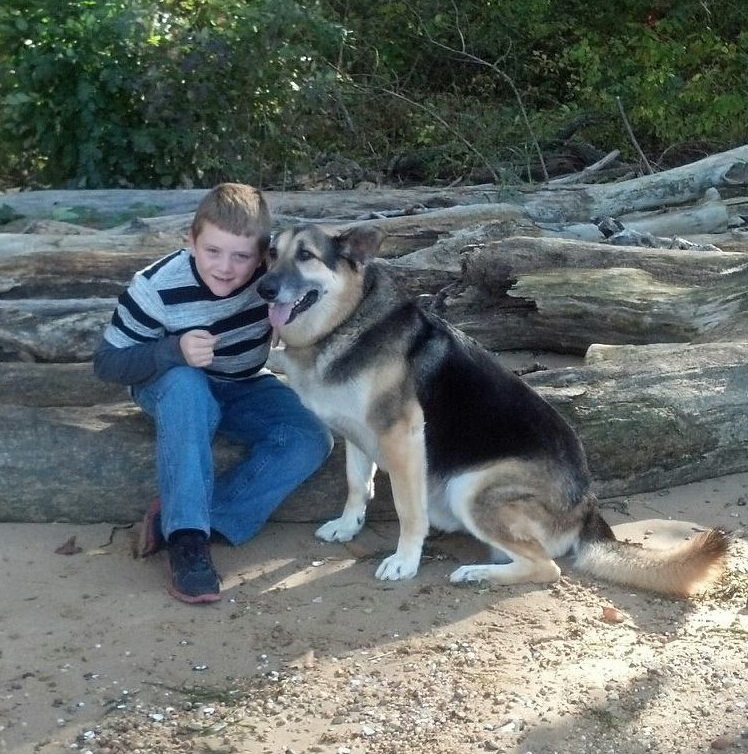 We thank his fosters for taking Luke into their home and loving him during his twilight years. 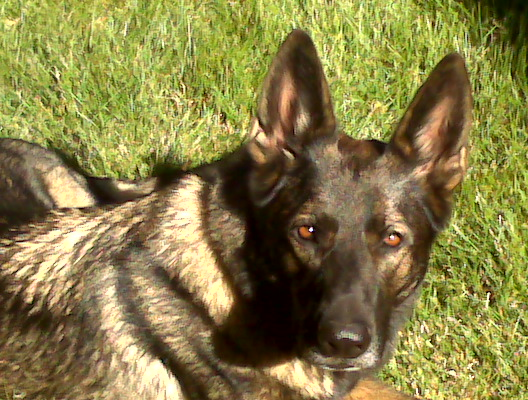 It is with a very heavy heart that we must report the loss of our very precious Ziva. We adopted Ziva November 1, 2014, the same day that she adopted us. 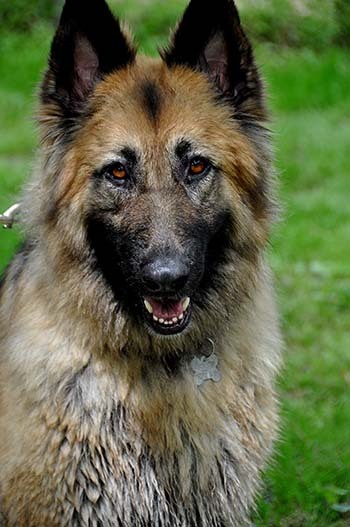 Ziva was a senior dog at the age of 7. We had almost 2 years with her but would of loved many more. 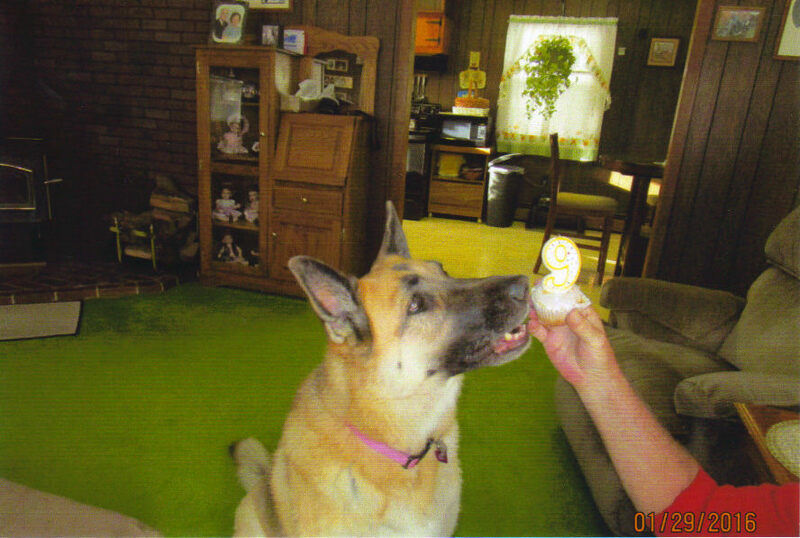 Ziva crossed the Rainbow Bridge September 7, 2016 at the age of 9. Ziva was diagnosed with Hermangiosarcoma , A very aggressive cancer (Blood vessel cancer) on August 22, 2016. 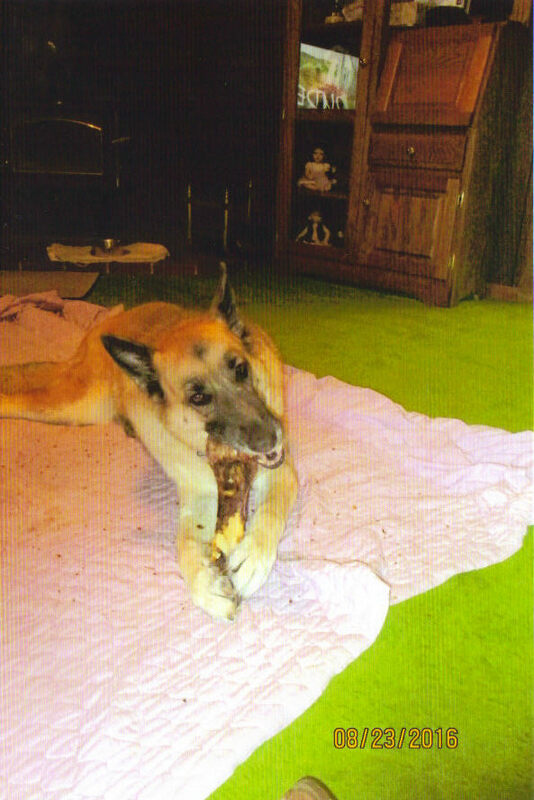 By the time Ziva showed any sign of illness, she already had a massive tumor on her spleen, smaller tumors on her liver and lung. Our vet told us that the outcome was very bleak with this type of cancer. So we made the decision to just make her as comfortable as possible for the time she had left. The meds seemed to be helping at first but than she started to decline rapidly and was showing signs of internal bleeding. We had to make the hardest decision of our life to let our baby girl go. We are sure we did what was best for Ziva, but it still breaks our heart that we didn't have alot more time to spend with her. 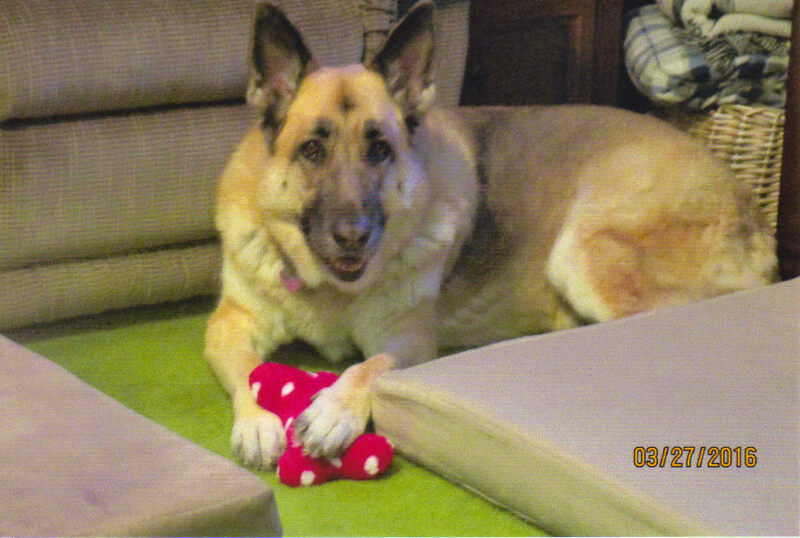 Ziva was a total joy to have as a member of our family. She was much more than a pet. She was like our child. Ziva fit right into our daily routine from day one. She was meant to spend the rest of her life with us. 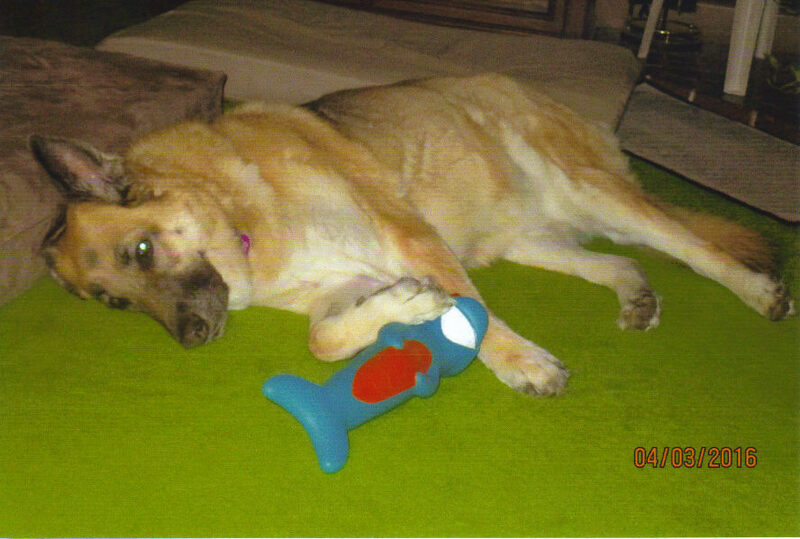 We are so happy that we could give Ziva the happy life that she deserved. Ziva certainly made our life happy everyday! She loved us as much as we loved her. She wanted to be with us no matter where we were. 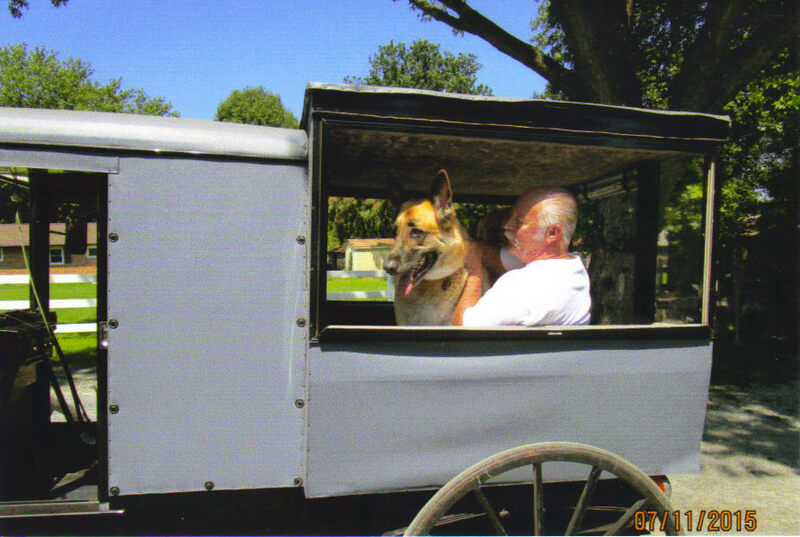 Ziva loved to ride even if it was just a short trip into town or a long ride on vacation. All you had to say is, do you wanna go bye byes and she would turn inside out. 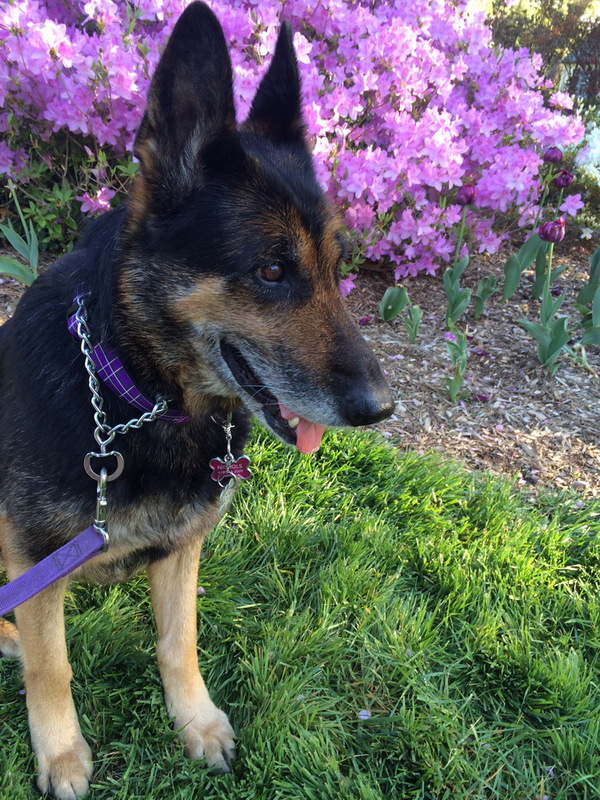 Ziva loved to go on long walks and loved people. (She was protective of her mommy) but a real gentle giant. 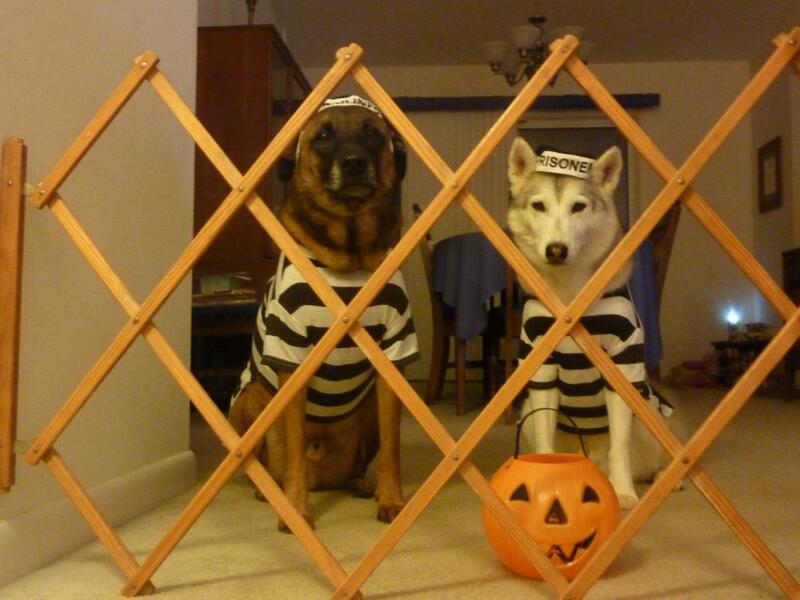 (Just bein the German Shepherd that she was suppose to be.) She did pretty good most of the time when we met other dogs. There were a few she didn't like. She was a very spunky 9 year old. She loved to play. Tug of war was her favorite but she liked to fetch also. She was our Angel. A very BIG BEAUTIFUL GIRL. We always got alot of compliments wherever we went because she was so pretty and well mannered. Ziva always watched mommy leave for work and as soon as I pulled out she would grab a toy and make daddy play with her. Ziva was always laying at the front door when it was time for mommy to come home from work and jump up when I pulled in and met me at the back door. I always got lots of kisses everyday and boy do I miss them! Ziva would come into the bedroom in the morning and give me a big kiss than go around to daddy and stick her cold nose under the covers until she found his back. When Ziva got up everybody was suppose to be up. She made us laugh everyday. Ziva had such a wonderful personality. Ziva was a true gem! We could go on and on about our wonderful girl, but I guess I better stop here. Thank You MAGSR for giving us the chance to make Ziva's and Our life so much more fulfilling. Ziva we love and miss you!! It is with great sadness that I write to inform you that Duchess (fka Bryson) went to wait for us at Rainbow Bridge today. She was diagnosed with kidney failure last fall and her condition progressed to the point that we made the painful decision to let her go. 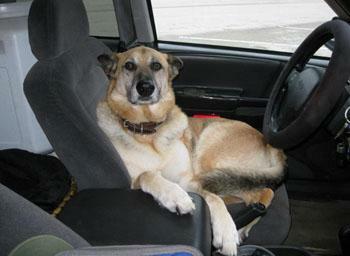 Duchess came to her forever home in March of 2007 and quickly became the focal point of our daily routine. Dogs pick their humans, and Duchess picked my wife. Those two were inseparable; whenever I suggested that we go somewhere or do something my wife's response was "can Duchie come too?" My wife grew up with dogs but says that Duchess was the best dog ever! Duchess loved playing Chuckit, or any kind of catch. She would sit on the landing at the top of our stairs and catch a ball lobbed at her and then drop it, then with her foot she would push it back down the stairs for us to catch. She would do that for hours if she could. Another game she would play was to lie down on the kitchen floor with a ball in her mouth and flip it or kick it towards you to see if you would kick it back. Duchess became a dual citizen in the summer of 2007 upon her first trip to Canada. She was a reluctant traveler at first – the only time I ever saw her show teeth was when the nice Northwest Airlines baggage handlers loaded her onto an airplane. But as time passed she became more used to travel. 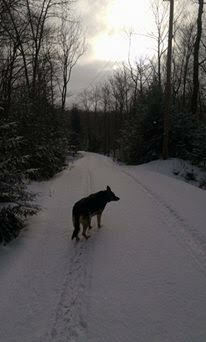 She really loved our farm in Canada and the freedom it gave her and was pleased when we retired here last year. 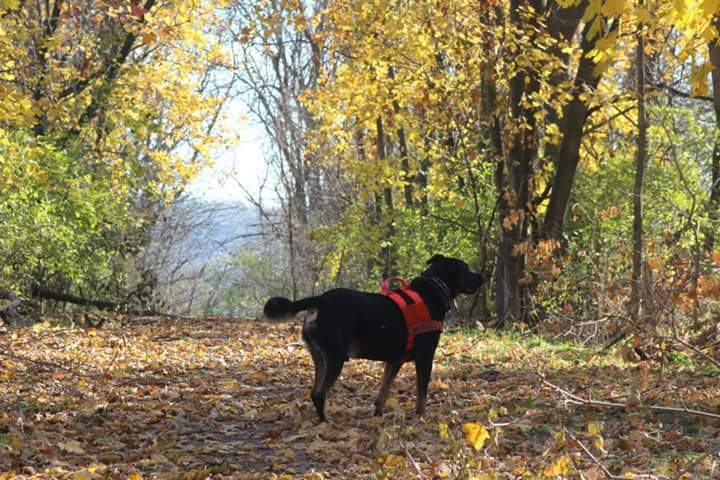 She especially loved our walks through the fields off leash and free to explore and sniff. 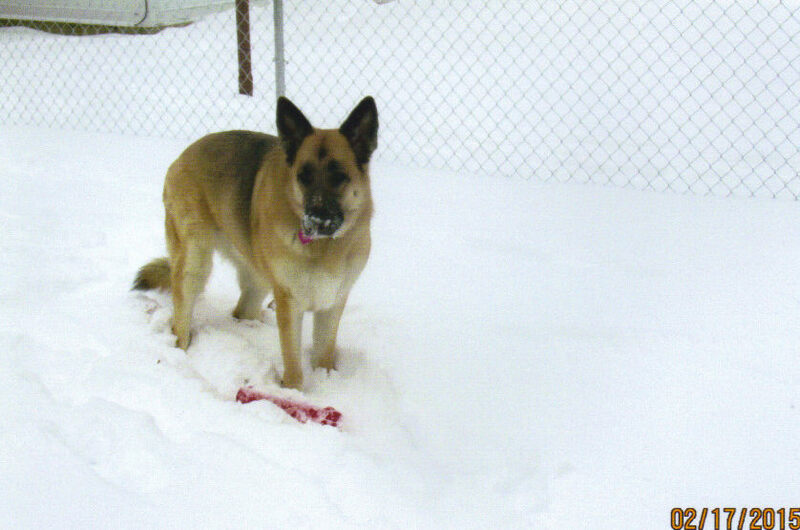 Unlike me, her favorite season was winter; she couldn't wait to play in the fresh snow! Duchess was very patient with children, although we don't have any. One of our most favorite sayings came from the three year old daughter of good friends who was unsuccessful in trying to catch up to her and said in frustration, "but Duchess, I just want to hug you." We have been telling her that ever since! She got along with just about every dog around (and even cats), but her beau was the next door neighbor's Dachshund. It was comical watching the two of them play. Our girl was a great ambassador for dogs. 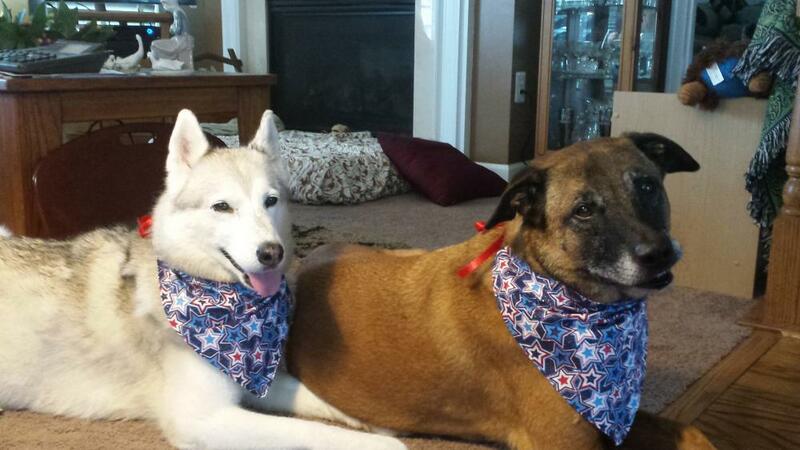 Even people who didn't like dogs would comment on how well behaved and sweet she was and many came to love her. We would like to thank the staff of MAGSR for all the work they do. We would adopt from you again except we are now in Canada. We loved our girl very much and are very sorry that she had to leave us, we will miss her. Rest in peace, Duchie until we meet again. We will never forget you. 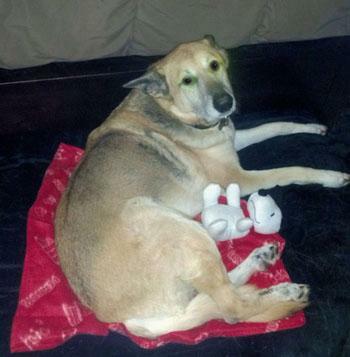 Haylee was a beautiful dog with a very friendly personality. Once she got to know you, she would cover you with kisses (aka licks). She was happy both running around, acting goofy and relaxing. She was wonderful with children and loved her chew toys too. This beautiful girl was diagnosed with Addison's Disease in November. 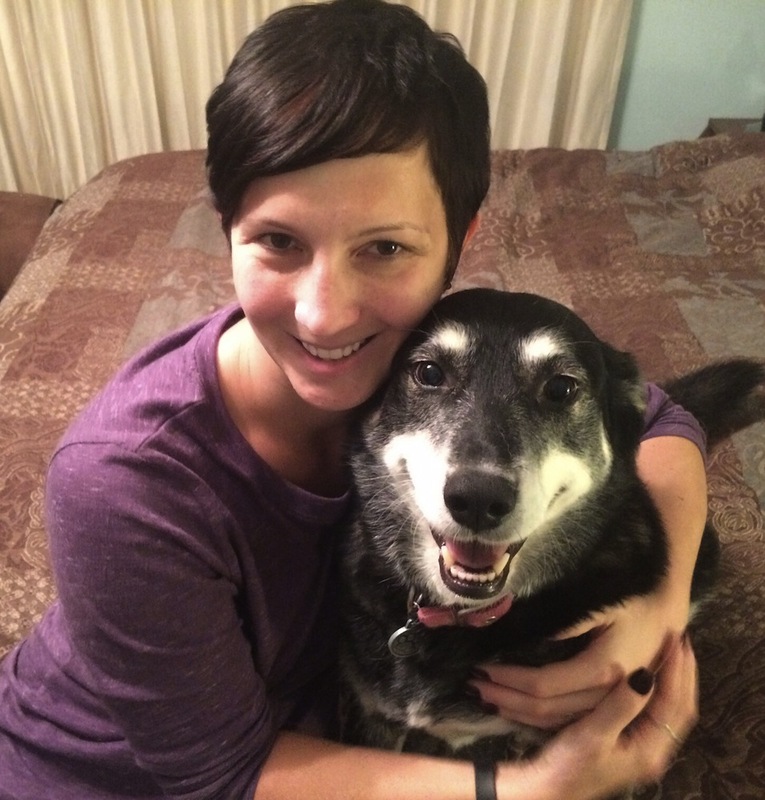 Prednisone and steroid injections helped to keep her healthy until now. 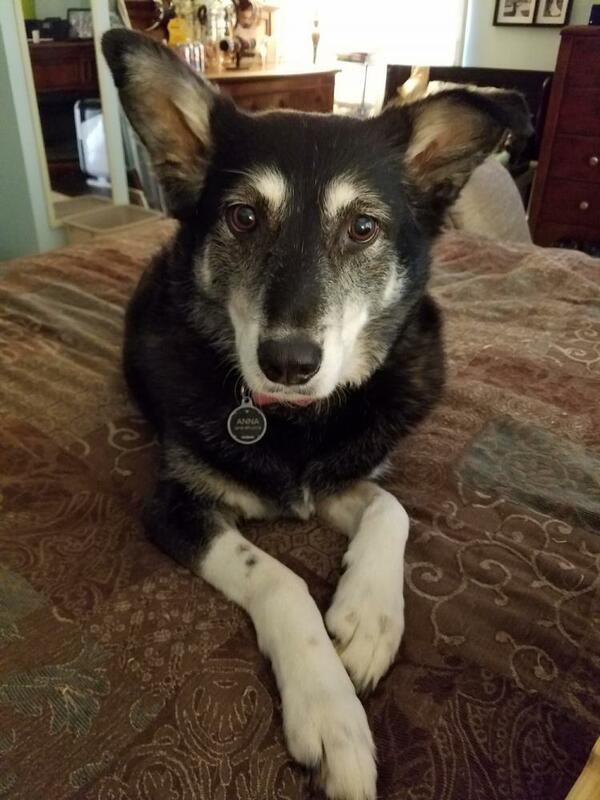 Sadly, due to the Addison's and other accumulating health issues, our sweet Haylee crossed the rainbow bridge this evening with her fosters by her side. 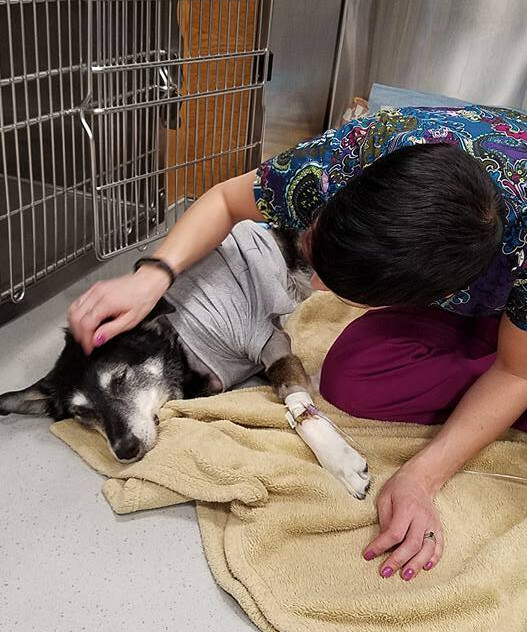 Thank you to Haylee’s foster family who opened up their home and hearts to give her so much care and love in her last days. 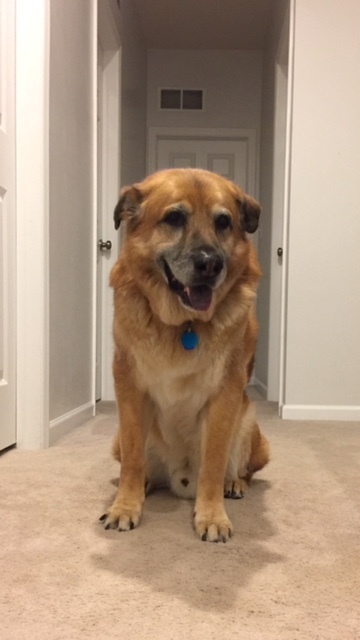 Our handsome senior boy, Wyatt, crossed the rainbow bridge yesterday afternoon. 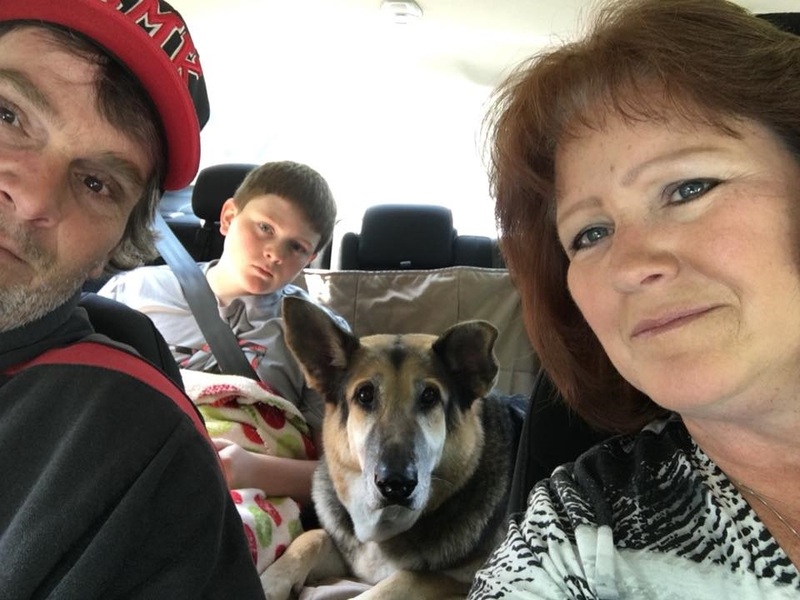 Wyatt came back to MAGSR in January 2016 after his owner was in a serious accident and was still in shock trauma critical care with a severe brain injury. 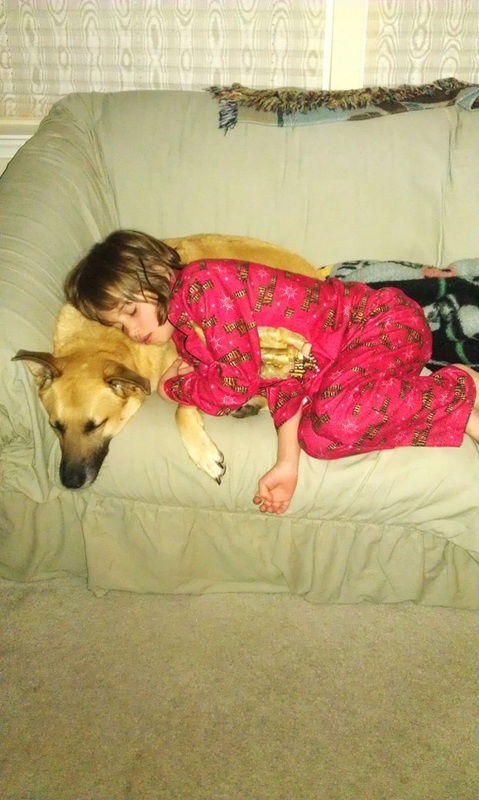 Since coming back to MAGSR, Wyatt was fortunate enough to be loved and cared for by his wonderful foster family. I received weekly updates on and pictures of Wyatt from his foster, as did his prior owner’s family - we even had a kind soul in California find Wyatt on our web page and fell in love, so he donated towards his care. Unfortunately, Wyatt continued to decline over the last month or so. 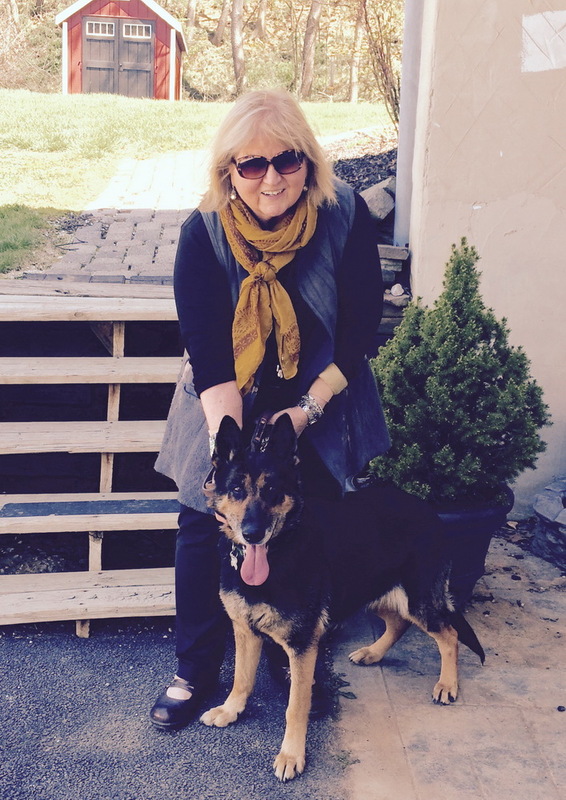 Recognizing that Wyatt was ready for peace and no more pain, he crossed with his foster mom by his side. Run free handsome boy without any more pain. 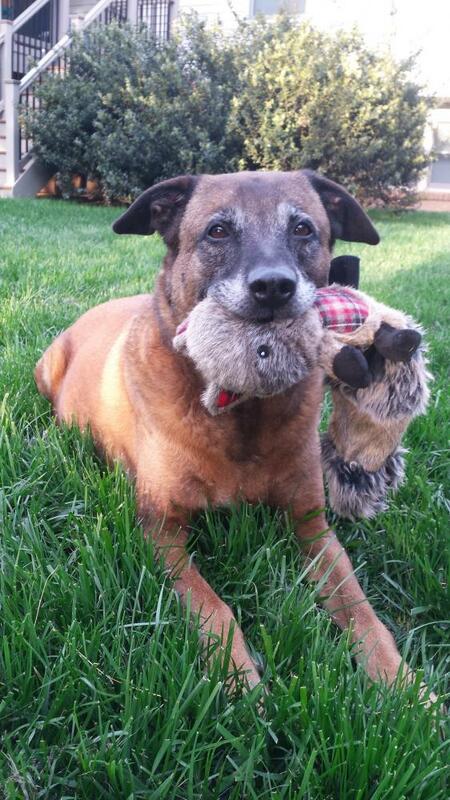 Thank you to Wyatt’s foster mom who opened up her home and heart to Wyatt and give him so much love in his last days. On May 15th my family and I tearfully said goodbye to Big Bear. 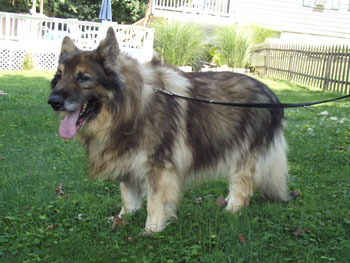 We adopted Bear shortly after our German Shepherd Lani (MAGSR alum) passed away. My family and I felt an immediate connection with Bear when we met him. He helped heal our hearts and brought a lot of love and peace to our home with his kindness and gentle manner. His heart matched his big presence. 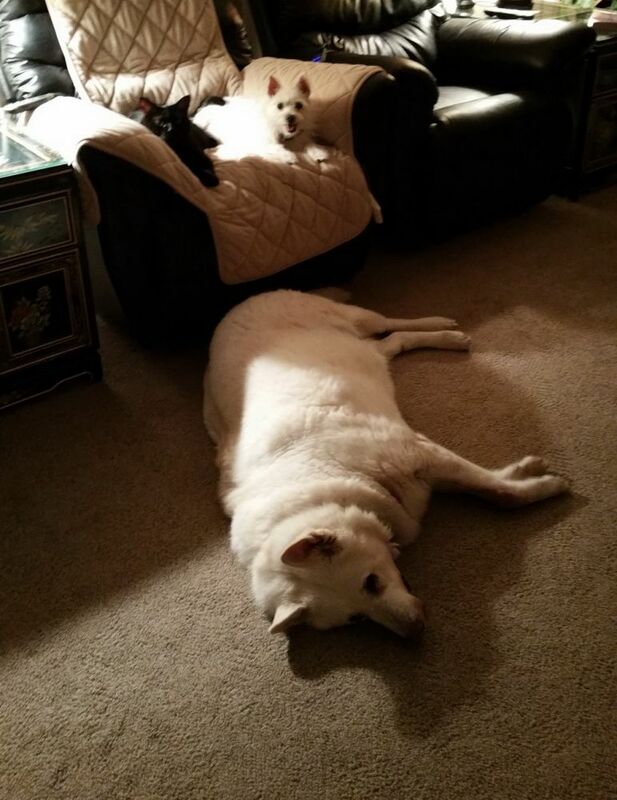 We were a little reluctant adopting a senior dog before Bear, but we are so happy we did. People often say that he was lucky to have us being a senior dog but, in retrospect, it is we who are the lucky ones. 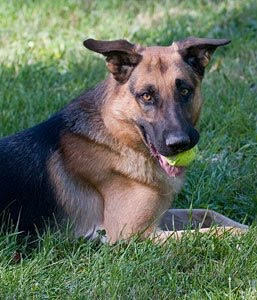 He was super smart, playful, and a faithful companion. He had so much to offer and so much love to give. My family and I would like to thank MAGSR for bringing Bear into our lives. Love you and miss you buddy. Meet you at the Rainbow Bridge. 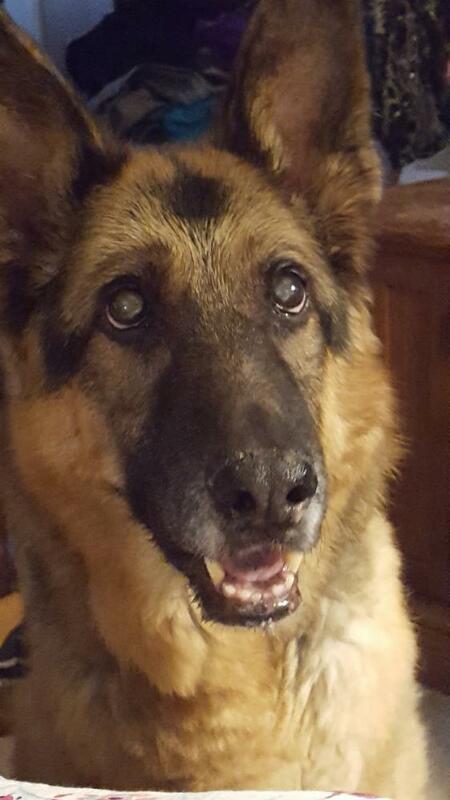 MAGSR is so sorry to report that Spartacus will continue his wait for a forever family at the rainbow bridge. 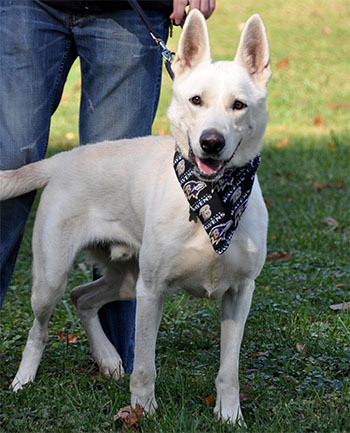 Spartacus was a favorite among the walkers at the kennel for his goofy puppy-like personality. 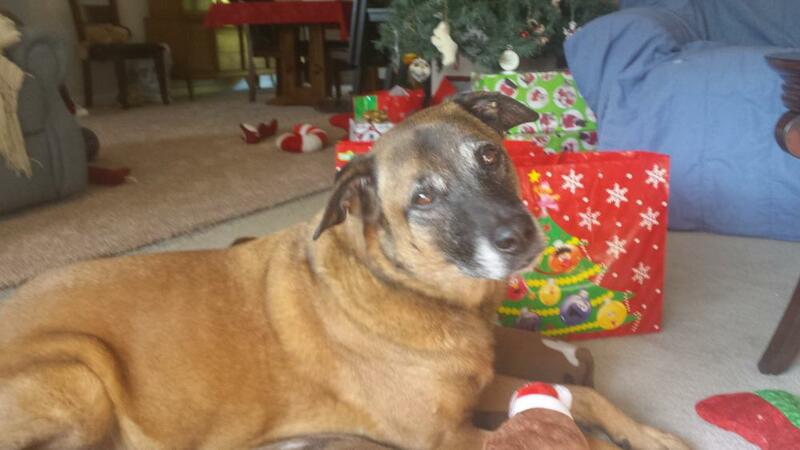 May Spartacus run free with all the other MAGSR dogs that have crossed the rainbow bridge. He touched a lot of peoples' hearts. 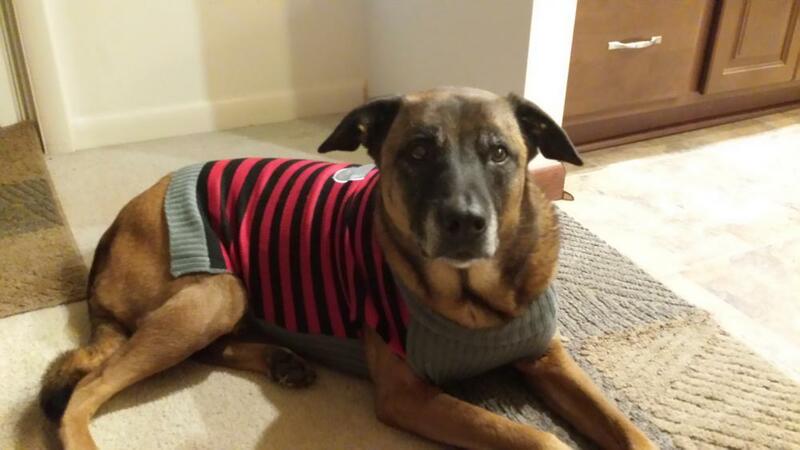 We are sad to report that our beloved Lucky (formerly India) left us on 11/8/15 to wait for us at the Rainbow Bridge. We adopted her in December 2003 when she was just eight months old. We renamed her Lucky because we knew she was lucky for being rescued but we were even luckier to bring such a sweet dog into our lives. 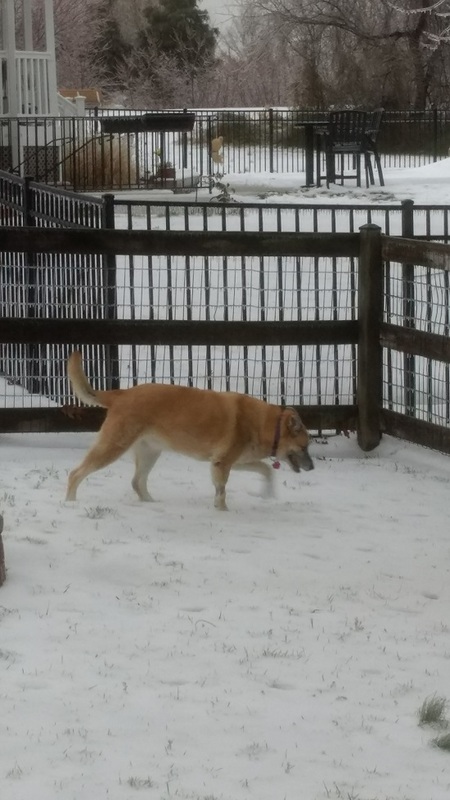 She had been with us for almost 12 years and was the perfect dog for us. She grew up as part of the family and was always one of the kids along with her human siblings (the youngest her same age). She was the perfect hiking and play partner but also enjoyed just hanging by our sides. Age slowed Lucky down and she began to have difficulty moving. Finally, old age took over and we had to make the difficult decision to say goodbye. 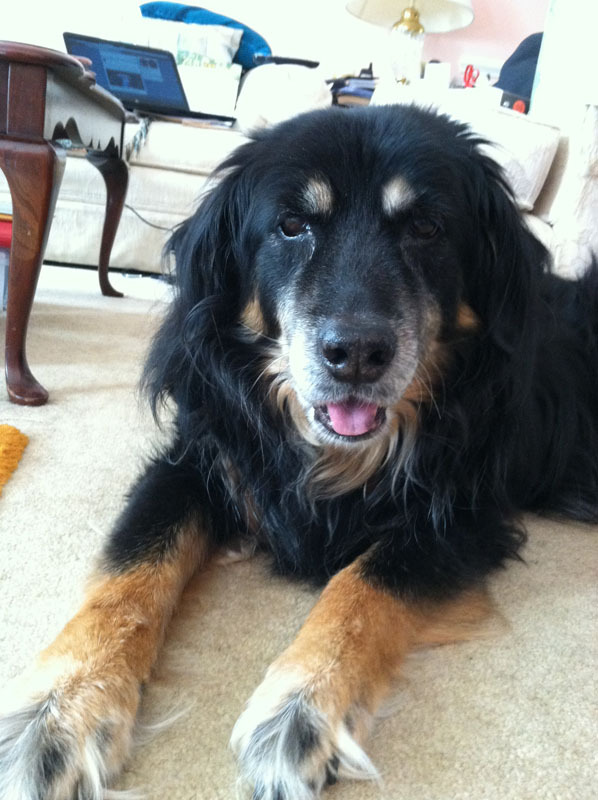 Our hearts, home, and lives are a bit emptier these days and we miss her wagging tail that greeted us every day. 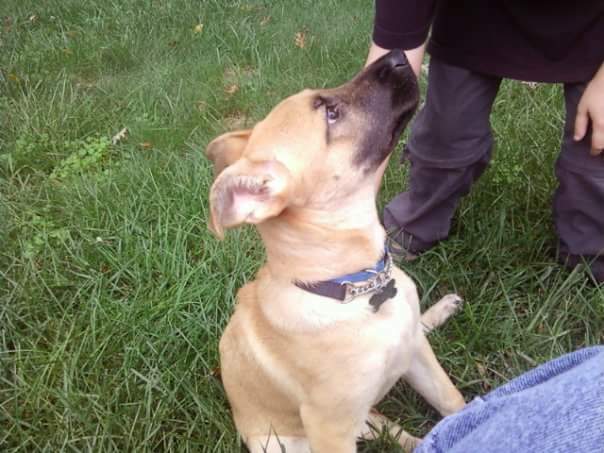 We have attached a picture of her when she was just a year old. 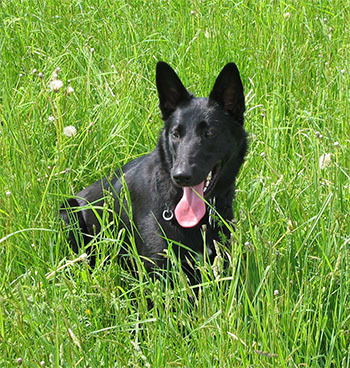 This is how we picture her now, running in the tall grass and free of pain. We thank you for providing us with our wonderful companion.